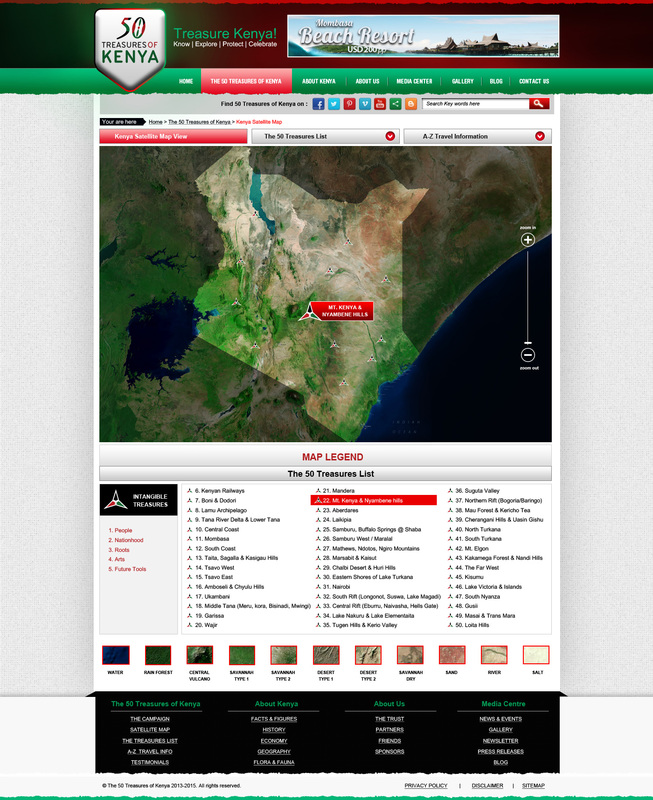 Its Kenyan…and its the most terrific website ever!! An amazing meal has been cooking in the 50 Treasures of Kenya kitchen. This meal will satisfy the hunger of all patriotic Kenyans, friends of Kenya and travellers who appreciate the beauty of this country………..Look out! Its hot and its the 50 Treasures of Kenya website. 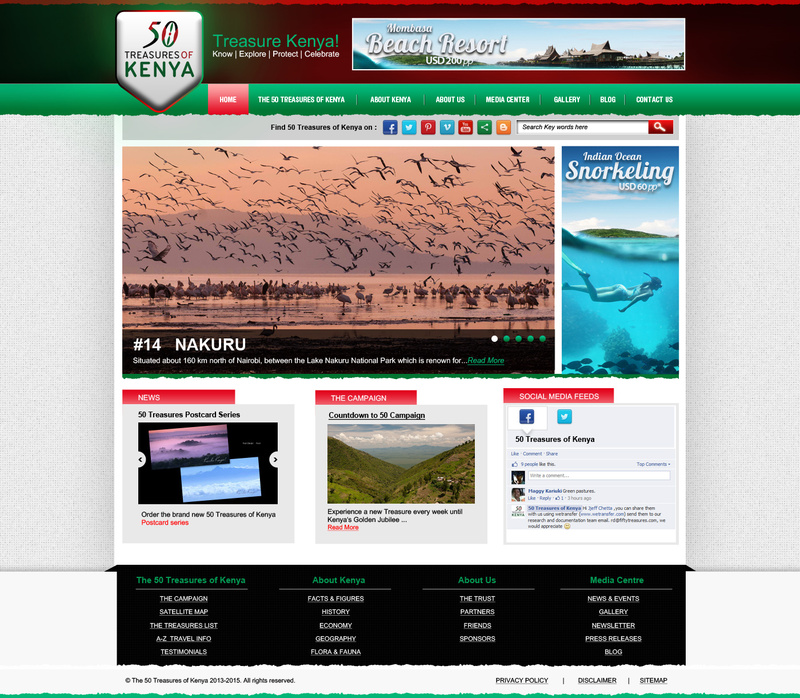 www.50treasuresofkenya.org is the web address, log in and see the awesomeness of Kenya. It will be the best and most complete website on Kenya . For practical travel information, high quality photographic material that will wow you, go for a virtual tour through this website. 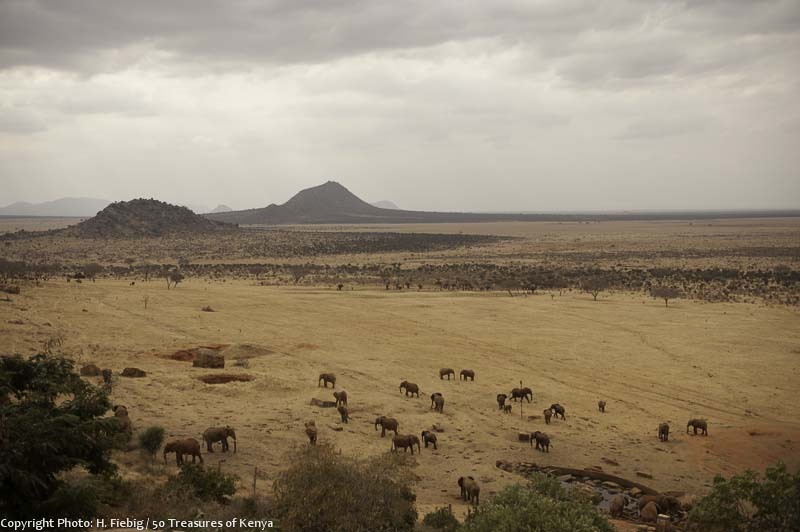 Tsavo East: Kenya’s largest conservation area! 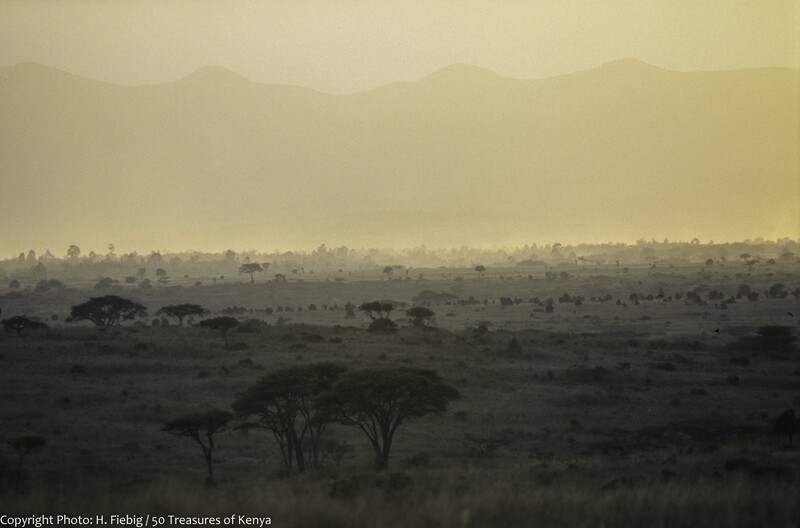 Tsavo East National Park is Kenya’s largest conservation area. Together with the neighboring twin park of Tsavo West, it is listed as number three of Africa’s mega parks! Many people underrate Tsavo East, simply because they are not aware of its wild, unknown north, an unspoiled paradise for explorers in the search of absolute serenity, which was a no go zone for decades until recently. Hence, most accommodations and guests are found in the south near Voi. A huge herd of Red Elephants is gathering at a water hole below Voi Safari Lodge. Accompany us on our safari through the park of indefinite vastness and follow untamed Athi River into the heartland of the famous Red Elephants! 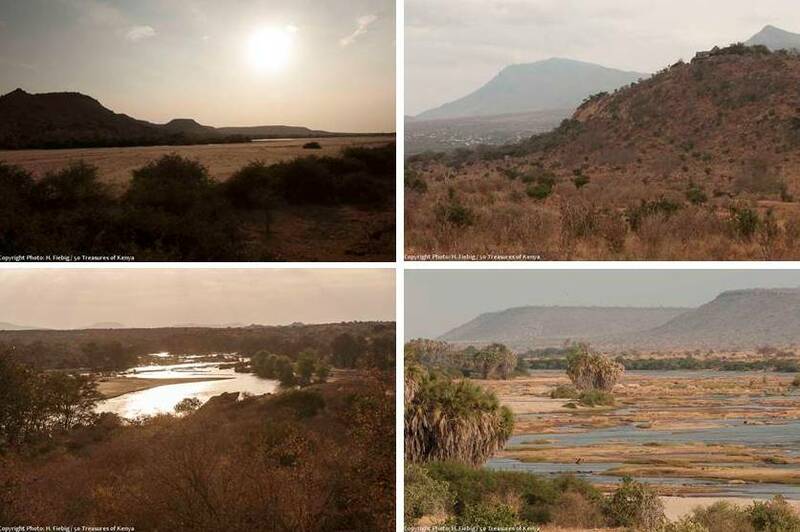 Discover both faces of Tsavo East, the mild and the wild! Once you have branched off Mombasa Highway and rumbled over the famous tracks of the Uganda Railway, merely a kilometer behind Mtito Andei, every human trace will vanish. Except for the two red tire tracks which carry you deeper and deeper into an absolute wilderness, until even the humming of the lorry engines and the rattling of their trailers have fainted completely. Saying goodbye to civilization: After branching off Mombasa Highway, the humming of the lorry engines and the rattling of trailers vanishes. The early morning sun stands still low, turning the dry land and its faded colors into a glowing beauty of yellow grass, orange bush and crimson soil. It is a red, so intense, that you could think of a giant tinting the earth with his blood while he struggles through the dense forest as millions of thorns rip his clothes and skin to pieces. Every plant, it appears, whether grass, shrub or tree, has molded its own defense arsenals of poisonous saps and spikes, needles, hooks, thorns, barbs or stings. The nature surrounding us is stagnant, akin to a queer dream. It has encapsulated itself from the world, hibernating until the next rains. Hornbills are the only living beings, as we see them hovering through the branches, holding their creaky, ghostly conversations. And there are tiny dikdiks, shy as elves, that shoo into the undergrowth as we approach. 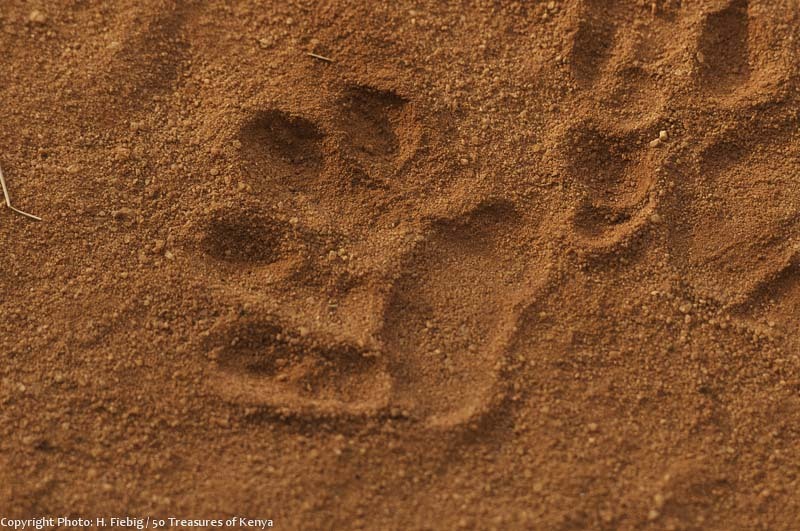 Tracks of a baboon on the red laterite soils which tints the elephant skin. Our path is a straight cut through the impregnable vegetation, the only penetration that allows easy movement for us and the animals. We recognize baboon tracks and eventually elephant droppings in front of us, literally heaps the size of a football. But all the beasts seem to have moved away, attracted by what pulls us too: the Athi River. 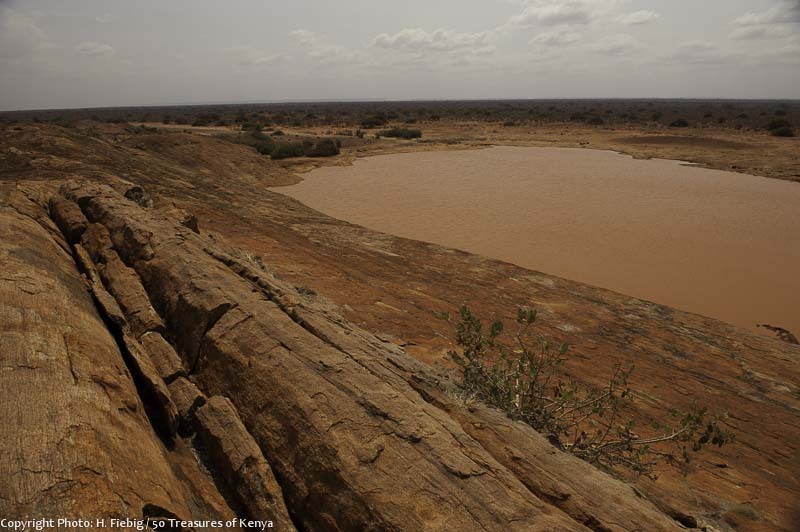 It feels ironic that the major obstruction to our discovery travel through the wild, semiarid northern part of Tsavo East National Park is attributed by the only open water in this huge stretch of dry land! Tsavo East measures 13.747 km² which is significantly larger than the western twin brother’s size of 9.065 km². 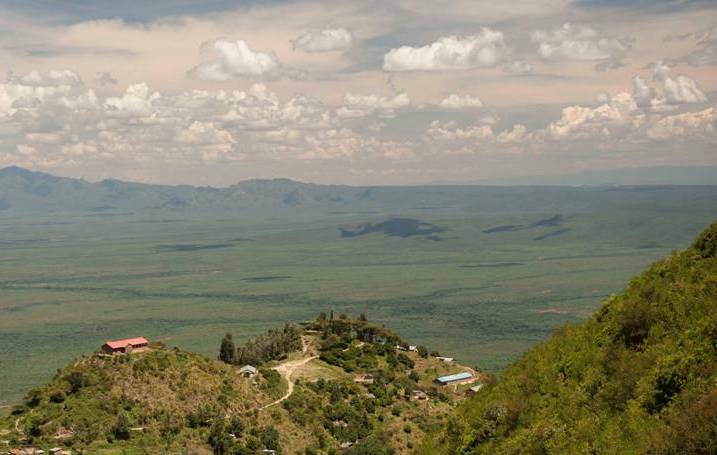 If you counted in other conservation areas of the region, such as adjacent South Kitui National Reserve to the North, Chyulu and Amboseli National Parks in the West as well as several private sanctuaries, such as Taita Hills Sanctuary, they form an even more titanic protected ecosystem. Tsavo East might be larger but with an average precipitation of 510 mm it is also much drier and less diverse than Tsavo West. Its southern part is dominated by plains of grass and bushland which change over to semi deserts as you move north easterly. Appealing hills can only be found at the park’s western fringes. The thick, refreshingly green riverine forests on the banks of Athi, Galana, Tiva and Voi River offer a welcoming change in the dry land. 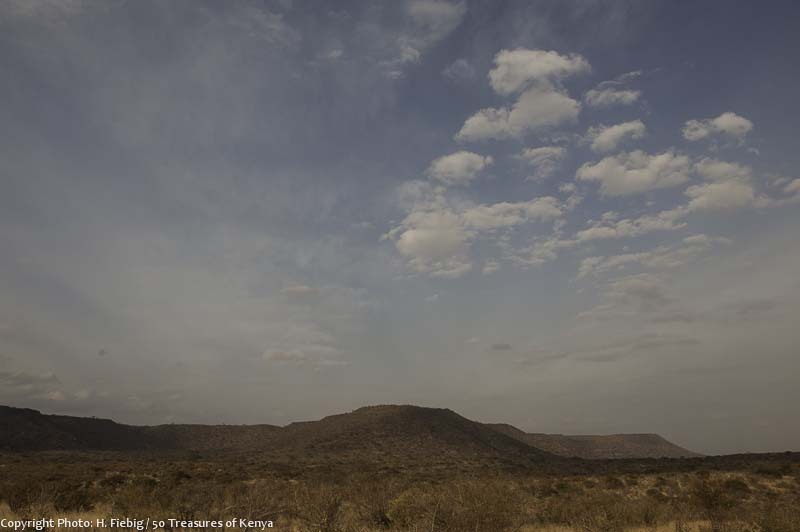 On the other hand, it is exactly the monotone, boundless landscape which accounts for much of Tsavo East’s special appeal. “Well, there is a ferry, that’s true. But …”, says Steven and hesitates. 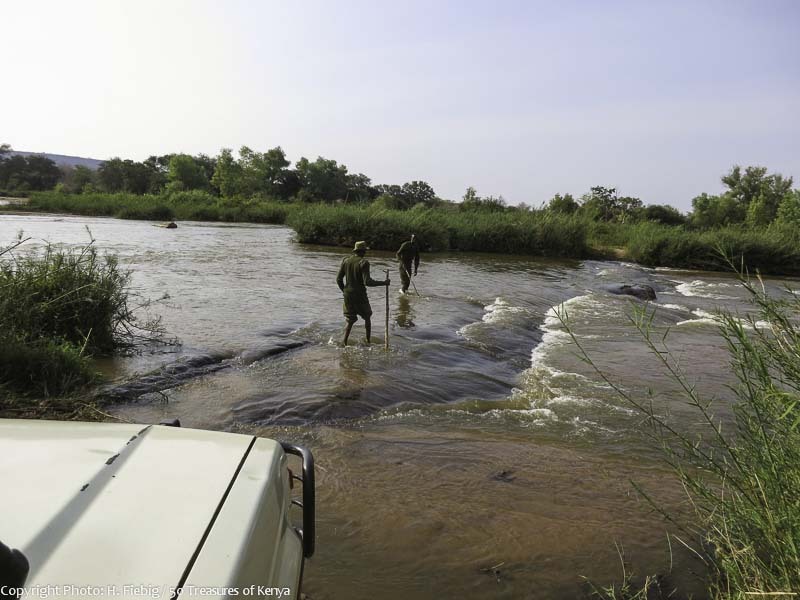 “… but I fear it is for pedestrians only …” “…!” We are taken by surprise for the KWS rangers at the gate didn’t indicate there might be a problem crossing the river. Steven works for the Sheldrick Elephant Trust which runs a remote bush station on the banks of Athi River. Luckily, he doesn’t only come up with bad news, but also with a possible solution. “There is an old river crossing not far from here. Let’s go!”, he exclaims while hopping into the backseat of our 1997 Pajero, we affectionately refer to as the ‘Old Lady’. What we are looking for, is one of only three fords on a river stretch of several hundreds of kilometers. They constitute the only access points for cars, when you come from the south or the east and you want to go into the northern part of Tsavo East, an area far bigger than Nairobi. This still is a very, very wild corner of Kenya! 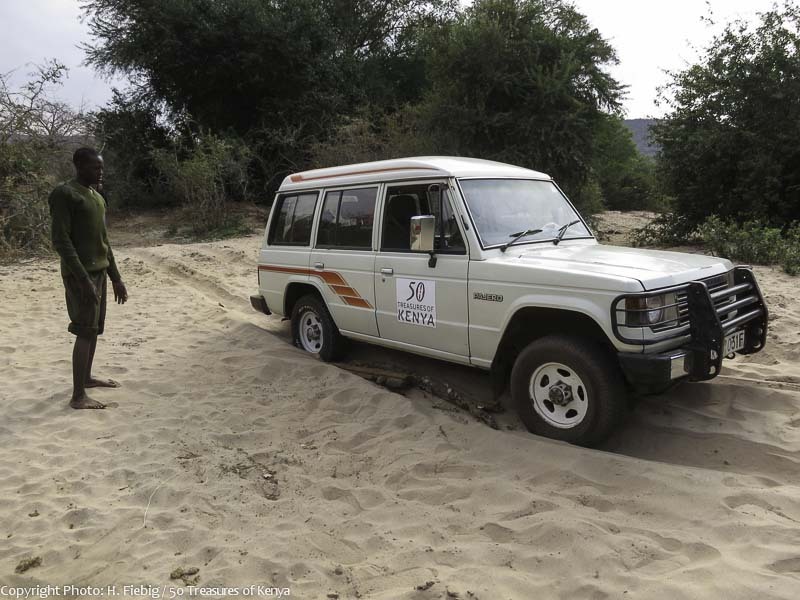 Our joint safari ends three kilometers onwards where we get stuck in the sandy banks of the Athi. So we leave the car where it is, and walk to the river. On a first view, it looks really frightening, if not impossible, and I don’t have a clue, how our Old Lady should ever make it through the strong current over to the other side. In front of us lies a diverse riverine landscape with Yatta Plateau as a backdrop. But the river, our problem, naturally captures my attention. The passage runs through a set of small rapids. It is composed of rocky, but slippery shallows, little sandbanks, islets and chunks of old concrete. Once upon time, it must have been a proper ford with sticks marking its fringes. Then came untamed Athi River and did its bit desolating the crossing. By now, the sticks have rusted away to short stumps. It already is a challenge on foot to find the right course crossing the river. How to manage that by car? Faded tire tracks at some points show, that others have successfully done it before us. That is somehow encouraging, but what if the car gets stuck, the engine dies down and we are washed away with our one and only car out here? Unfortunately enough, you can enjoy these situations only in the aftermath, when telling others about it. “It would mean an inevitable end to our researches!” says the boring angel on my right shoulder. “On the other hand, dude, let me tell you as a brother …”, replies the small devil on the left, giving cause for a second thought. “If we turn around at this point, it will mean an endless detour. Just think about the massive Tsavo East distances! Instead, let us dare to go for the unknown. That always has proven to produce some of the most impressive moments and memories of our research expeditions, hasn’t it?” He definitely has a point, and so we go as a huffy angle falls silent. Luckily, we are not alone, for without the aid of Steven, the ranger, we would have never found the right way! Moment of relief – and a clean car from below! We balance through the river on foot four times, back and forth, to check the course of the way and marking it. After beating soapy algae and the strong current, after narrowly saving my mobile phone and my pocket camera from drowning, I start to believe I can do the same with our 4WD-lady with Steven as my pathfinder. With a couple of stop and go’s in the river, we reach the other side without any trouble. We are proud of our car, the Old Lady, fresh and clean from below right up to the doors, as she is now! At a certain point of history, there must have been plans for a bridge over Athi river. 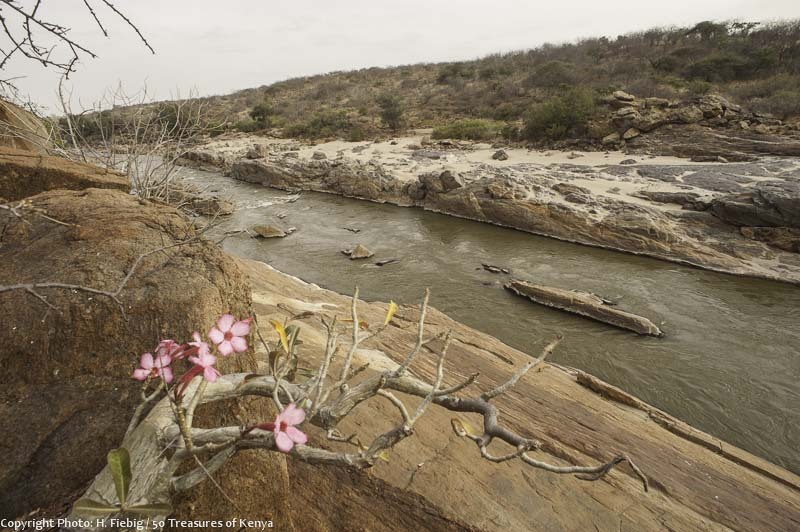 Some 30 km downstream, right before the spot, where Tsavo River and Athi River merge to form the Galana River, the rocky river banks form a channel which is merely twenty meters in width. Woodley’s Bridge Place (S2 57.658 E38 30.103) indeed is a perfect spot for a bridge, if it was ever been built. 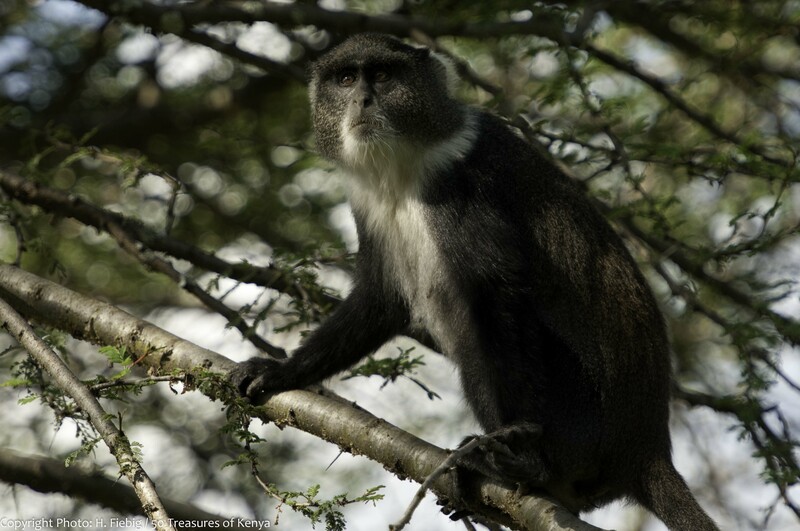 It is named after Bill Woodley, who was at one time the warden of Tsavo East. 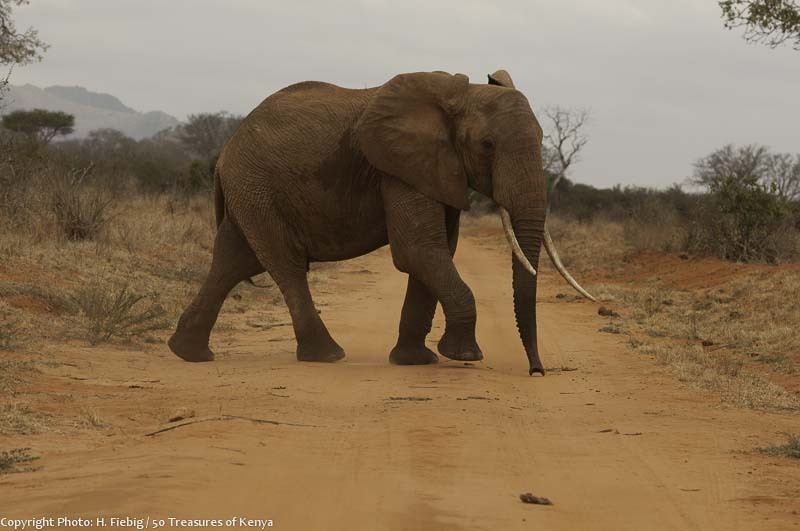 A foraging Jumbo between Galana River and Voi sniffing suspiciously for us. Talking of history. 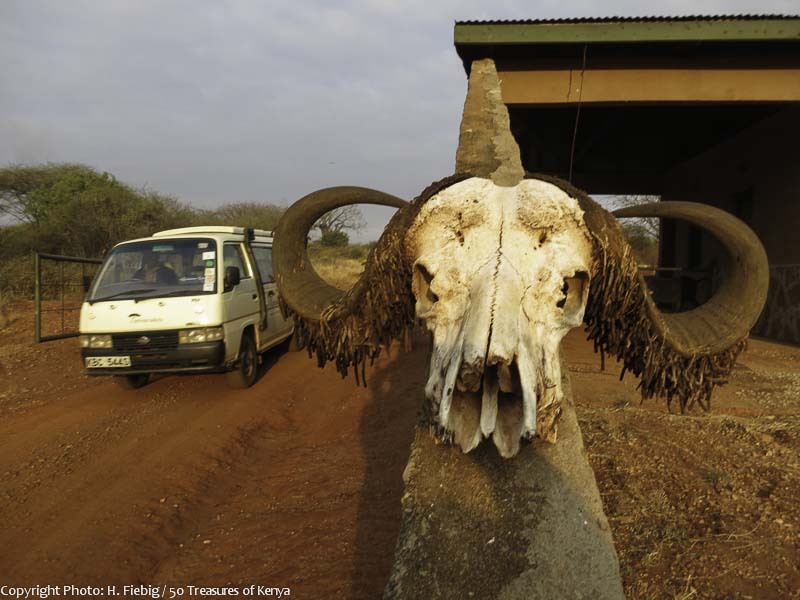 The Tsavo region became famous in the beginning of the 20th century for its elephants that bore tusks of record size and professional hunters, such as Denys Finch Hatton and Baron Blixen brought affluent customers here for trophy hunting. But the hunting business in Tsavo inevitably ended when the two National Parks were gazetted on 6th of April 1948 and David Sheldrick became the first warden. The Woodleys and the Sheldricks, two British-Kenyan families, have greatly contributed to the research and protection of the Tsavo wilderness up to this day. The Sheldricks got involved with elephants in particular and run the world famous Daphne Sheldrick Elephant Orphanage in Nairobi National Park, as well as a center for reintroducing orphaned jumbo youngsters into the wild at Ithumba, near the northern HQs of Tsavo East. Two of Bill Woodley sons also became rangers and served in KWS until some years ago. 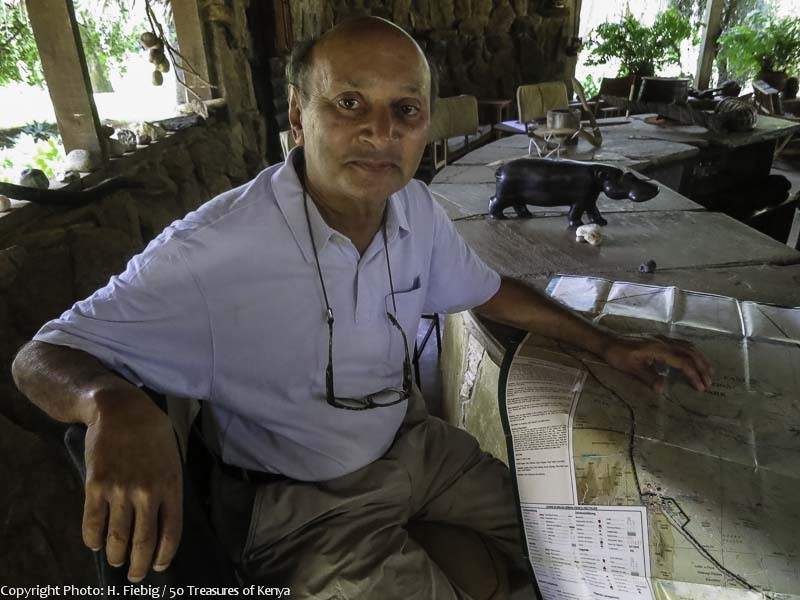 Mr. Rajui, lodge pioneer and our gracious host at Tsavo Safari Camp. 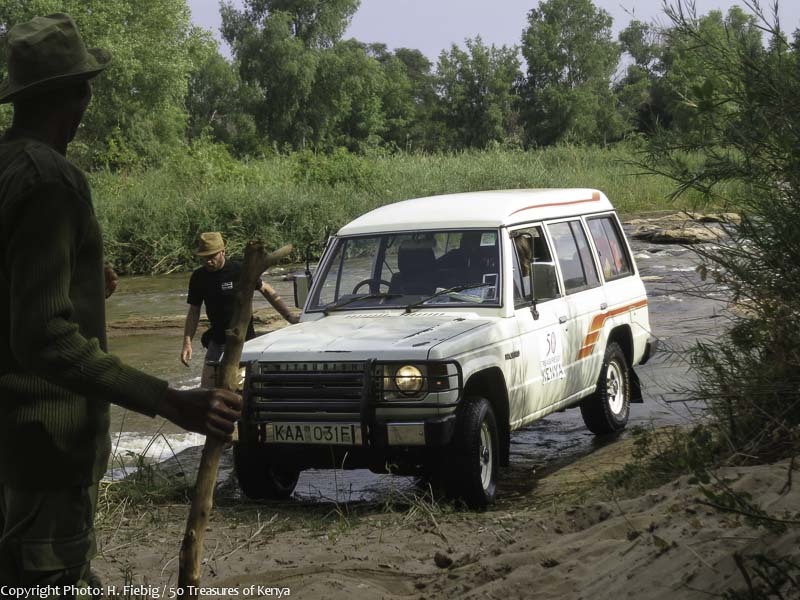 Our bridge to the past is Rajui, the owner of Tsavo Safari Camp which hides in a raphia palm forest a little upstream form the ford we happily mastered. He knew both, David and Bill, whom he flew around Tsavo with many times. Once upon a time, in the middle of the 1960s, Rajui opened and owned some of the very first Kenyan safari lodges like Kilaguni and Voi Safari Lodge. Today, he is slightly over 80, something, I would have never believed, and has downsized holding only three premises from his former company. His passion has always been the bush and his very special love clearly is for the wilderness of Tsavo East and this camp, which now is managed by one of his daughters. As we sit in the lounge, we describe the 50 Treasures of Kenya, before learning more about the camp and Rajui’s background. He is from a good family and nobody thought he should look for his fortune in the bush. His father, J.M. Desai, had played a vital role in supporting the struggle for independence. Mzee Jomo Kenyatta and many other African political leaders were closely befriended with J.M. Desai. Whenever needed, they would find a car and a safe place to meet at the family home during the late 1940s and early 1950s. But when the MauMau uprising started, Rajui’s father was put under house arrest. I feel very privileged for having had the chance to meet Rajui and hear about the birth of modern safari tourism in the late 1960s. Even more so, as I was able to meet all those historic figures whom he brings back to life with his stories and which I only knew from reading. After being so warmly received, it is difficult to turn down the offer for lunch, but we have to move on. Following Athi River downstream, we eventually reach the southern part of the park which is still some sixty kilometers or so away. Rajui equiped us with a brief but to the point description of the drive along the Athi and even gave away his secret spot on some rocks at the foot of the Yatta Plateau. Its here we enjoy an unobstructed view over the dry, grey bush which is nerved by a single green vein of life, the river and its forested banks. View of the region from some rocks at the bottom of the Yatta Plateau. For the next hours the 300km Yatta Plateau, a forested, impregnable wall and longest lava flow of the planet, forms the horizon to our left. To the right, Athi River, winding downstream creates a painting of untouched wilderness, of greenish rapids, shady palm thickets, acacia bush, dunes, anthills and sandy beaches. There is lots of game which all shy away from us, performing a ballet of incredible jumps as they dash over the track into the bush. I am seriously frustrated as I photograph a constantly growing derriere collection of gerenuk, impala, buffalo, Guinea fowl and the rare lesser kudu. 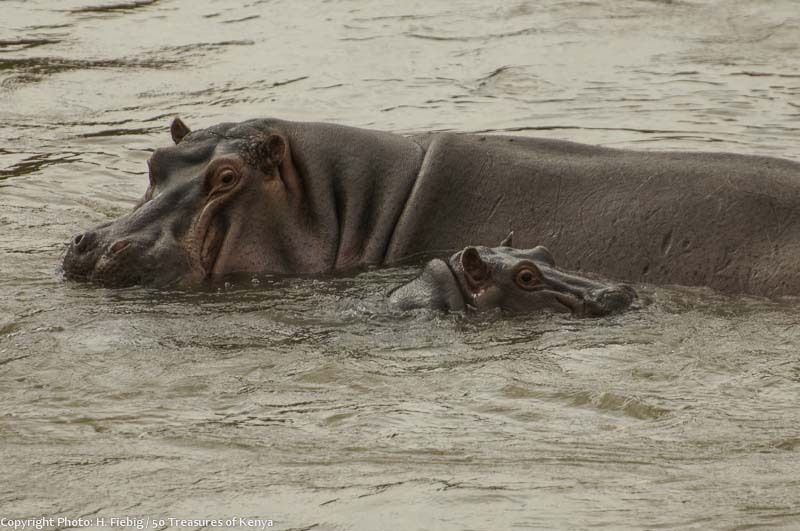 Together in the tub: Hippo baby and mom paddling in Athi River. I the case of the huge crocodiles lying on the sandbanks and the hippo herds drifting lazily in the deeper pools of the river, their only movement being the propelling ears, I would have hoped for more motion. It is the prolific birdlife of water fowl and savannah species that ease my disappointment. And when finally, the long and winding track offers another stunning view over the river, and we see an elephant family drinking on the other side, magically illuminated by the very last rays of the sun, while an impressive stand of raphia palm with bushy crowns raises in their back, I feel fully recouped. 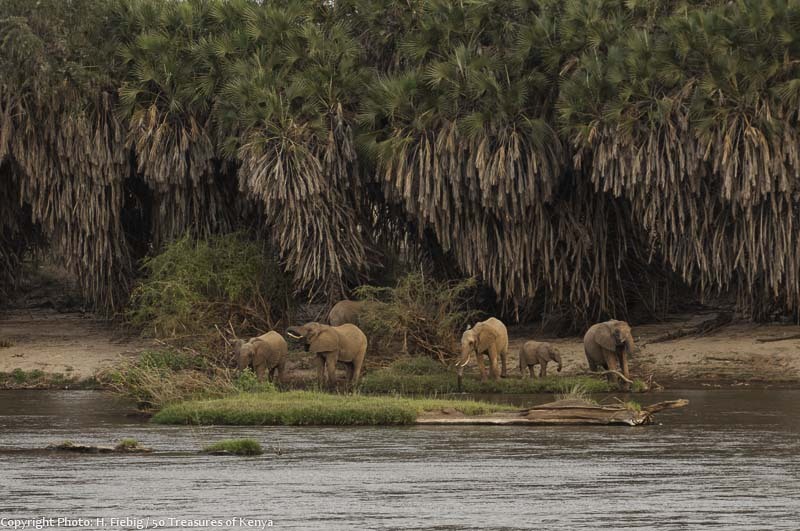 Drinking elephants in the last rays of the sun are towered by impressive raphia palms on the banks of Athi River. What has impressed us most about , is the fact that we had this unforgettable experience of the long river drive completely for ourselves. Throughout the whole day, we didn’t see a single other car! The track we were using is in a good shape except for a few corrugations and gullies, but it is apparently hardly ever driven on. 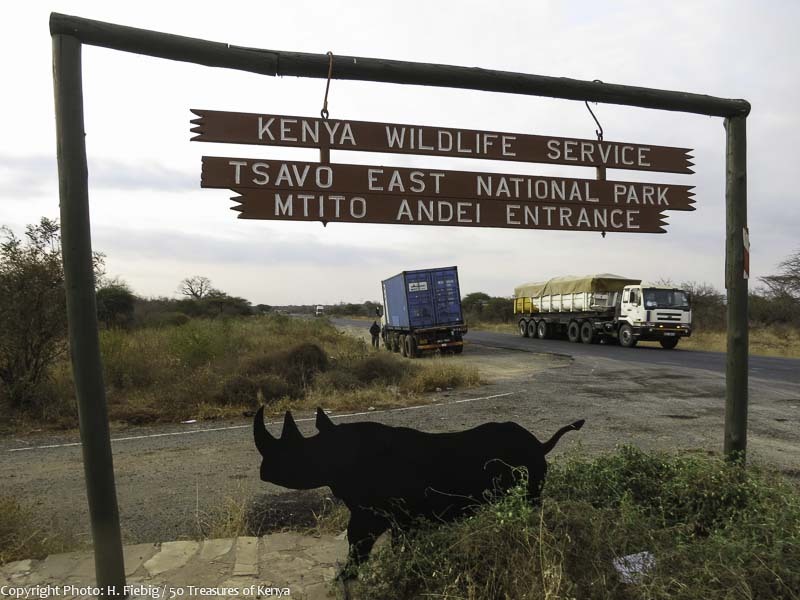 The Northern part of Tsavo East had been closed for 20 or so years when the war on poaching raged and created serious security issues. Since reopening, it seemingly has not yet been recaptured by tourism. Opposite Chapeya Epiyu Camp, the Yatta Plateau almost touches Galana River. A beautiful sunrise. During the last bit of our long safari day, we drive under the full moon, climbing and descending the Yatta Plateau until we reach the well built river crossing that carries us on dry tyres to the southern sector of and to Chapeyu Epiya Camp, where we find a place to stay. Most travelers visit the Southern part of Tsavo East, where the majority of lodges and camps are found. Because open savannah land is prevailing in much of the South, it is easier to spot animals here, too. As much as we cherish to charge the batteries of our equipment and the comfort of a shower, we still prefer the wild North and its total privacy over the mild South. The tracks here are to well kept to make us feel like explorers anymore. At least, we get connected to the bush radio and the safari bus drivers are happy to share their information on the last lion kills with us. It seems we are too ungifted to find the simbas but a proud male Somali Ostrich with his blue legs and neck, plus an angry elephant cow who mock charges our Old Lady to drive us away from her calf, are proper compensations. 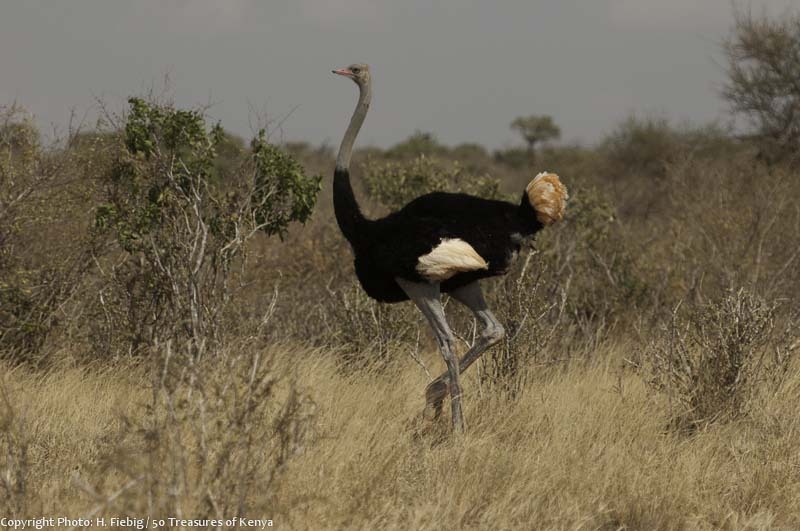 A proud Somali ostrich with blue legs and neck pays somehow off for not meeting Mr. Simba. Tsavo East is home to the Big Five, i.e. elephant, lion, rhino, buffalo and leopard. 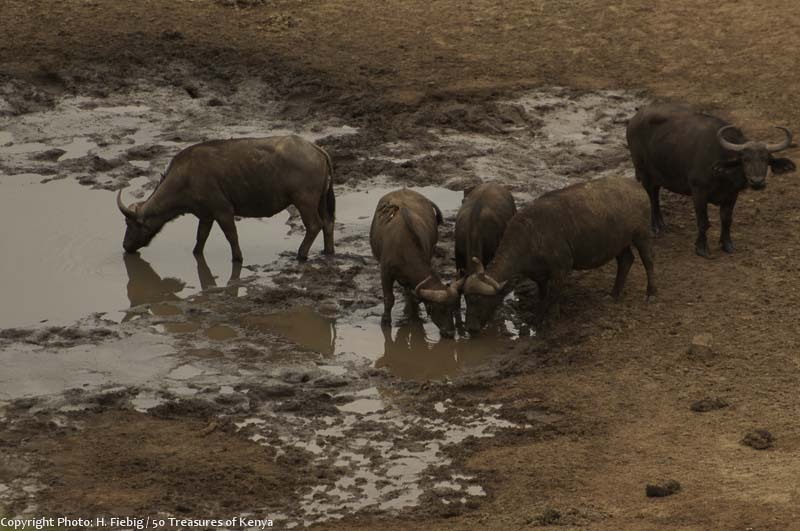 Especially during the rainy season, when the grazers move away from the rivers and water holes, it can be a challenge to spot them in the immense area of the park. Crocodile and hippo however are always easy to find at Crocodile Point and Aruba Dam. The shy but handsome lesser kudu as well as huge buffalo herds, various monkeys, leopards and the most diverse birdlife are most likely to be encountered in riverine bush and forest along Galana River. 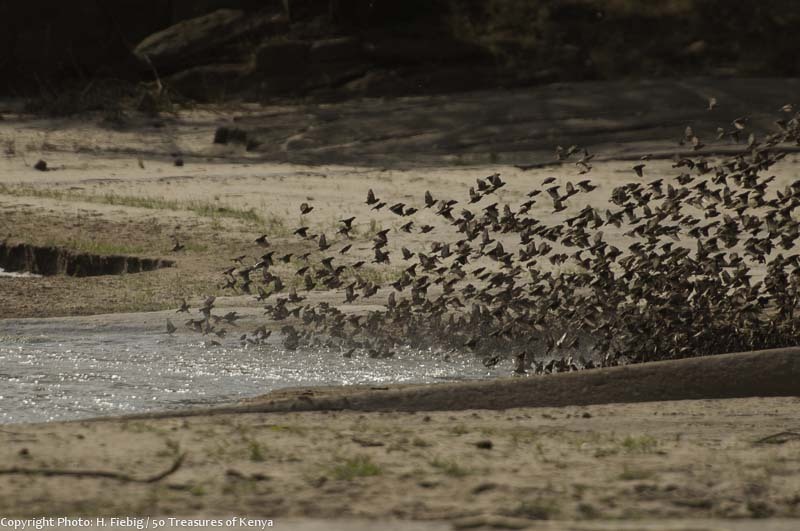 A huge flock of weaver birds bath and drink in a calm stretch of Galana River. Cheetah and lion are downright savannah animals are frequently seen on Ndara plains in the very south of the park. There are even packs of African wild dog in Tsavo East but they are roam over large distances so it is a question of luck to spot them. The mascots of Tsavo East have always been the famous red elephants although their rather peculiar skin color is not of genetic origin. Instead, the animals apply a body make-up of red laterite soil after bathing, probably to lower the menace of parasites and protect their skin from sunburn. Other prominent animals in the park are zebras, Grant’s gazelle, impala, giraffe, waterbuck, gerenuk, eland, oryx and antelopes. On top this, Tsavo East is an ark for one of the most endangered larger mammals; the Hunter’s antelope or Hirola, which is closely related to the topi and was only found east of Tana River originally . 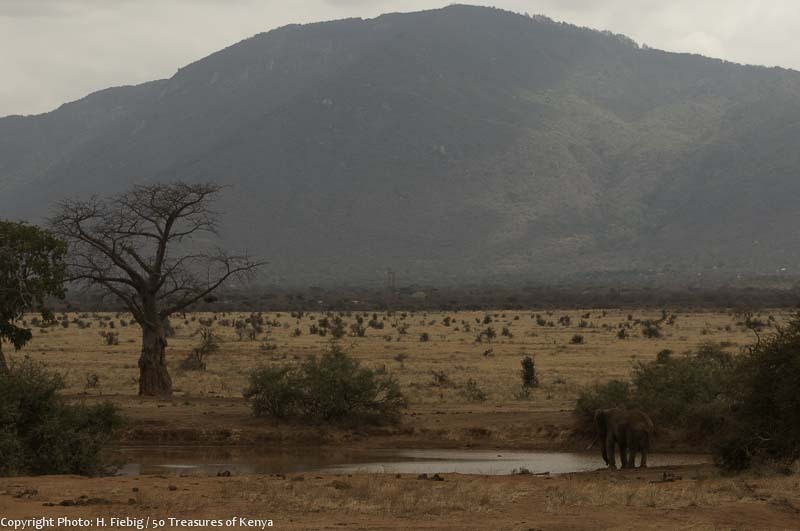 The only prominent elevations are found near the south-western boundary of Tsavo East, where a lone Red Elephant seems to enjoy the panorama. The big red elephant show starts as we approach the region around Voi Safari Lodge with its grass savannah stretching up to the foot of Taita Hills, and the eventual rocky outcrops. It starts with a single massive bull standing at a water filled pan, then suddenly, elephants are everywhere, foraging on the savannah plains, resembling mammoths from a long bygone era. There were literally families 15 or 20 heads crossing the road just a few meters from the car! Some elephants are particularly strict on their right of way. 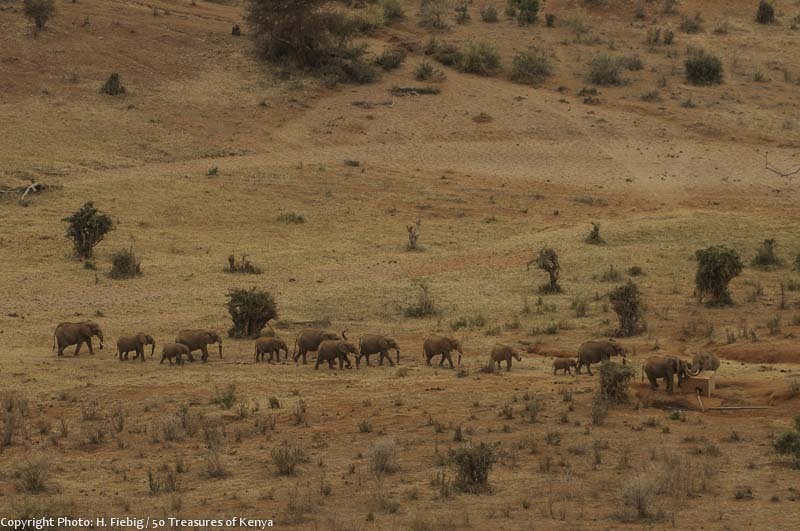 The impressive number of red giants gives us an idea of how it must have been in the 1950s, before droughts and slaughtering by poachers reduced the former 40,000 parchyderms of Tsavo to less than 5,000 animals. 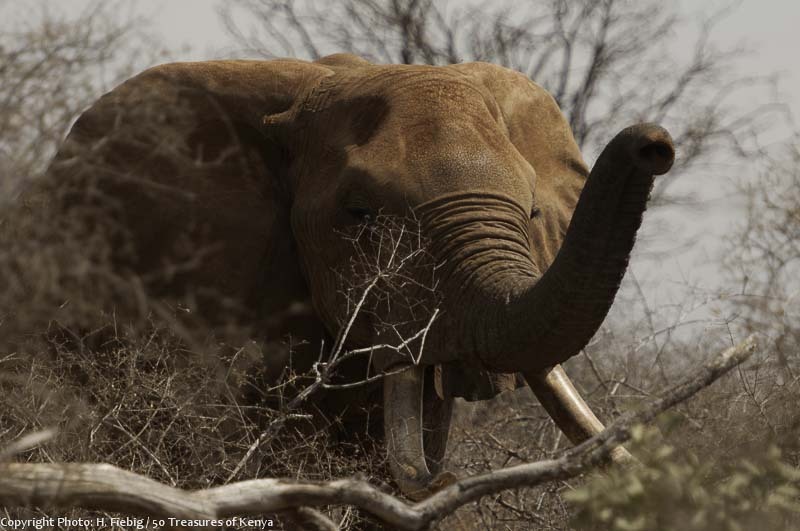 Today, the elephant population of both Tsavo parks has significantly recovered to about 13,000. But until historic numbers are reached, a lot of water will flow down Athi River, especially as poaching is on a dramatic rise again. The rhino population of Tsavo was hit even harder, as it plunged from 5000 animals to the verge of extinction. Today, there are around 100 rhinos in Tsavo, which are kept in fenced sanctuaries where they can be better guarded. A family of elephant approaches a leak in a water pipeline below Lion Hill Lodge. Our journey ends with a literal highlight as we sit on the veranda of Lion Hill Lodge, right at the boundary of Tsavo East. The beautiful land below stretches up to the far horizons, as clouds and sun are splashing colors and light beams on the canvas of the evening sky. Another elephant clan treks past us to drink at a leakage on a water pipeline. After a long and hot drive we enjoy our sundowner, recollecting the events of the past two safari days, which offered enough events for a complete week. Voi boasts a bit of New York flair when shot with a long exposure night shot. 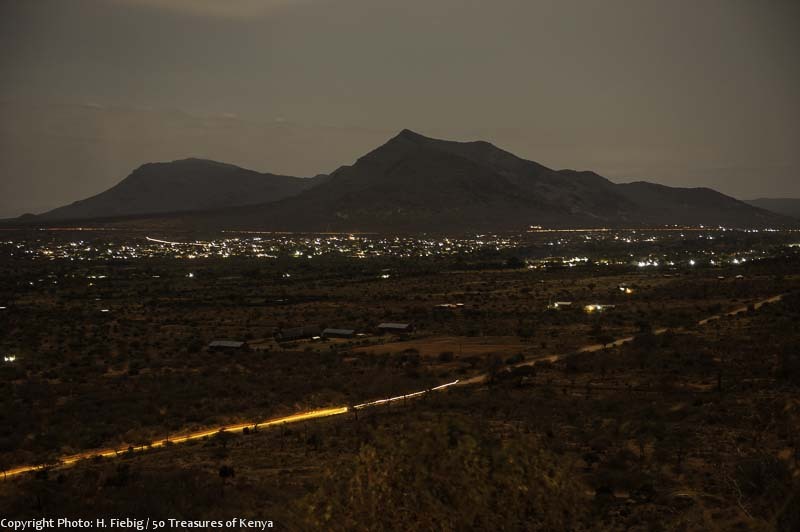 The headlights of cars on the road to the National Park in the foreground, and of the lorries on Mombasa Highway in the back look like marker bullets. Lion Hill Lodge offers a sight into two worlds as the wind carries the lion’s roar and elephant sounds to us on top of the hill as Tsavo East sinks back into complete darkness. But behind our backs, the lights of Voi Town glitter and the headlights of the trucks on Mombasa highway appear like laser bullets moving in super slow motion through the night. It is here, that ancient and modern Kenya confront each other. 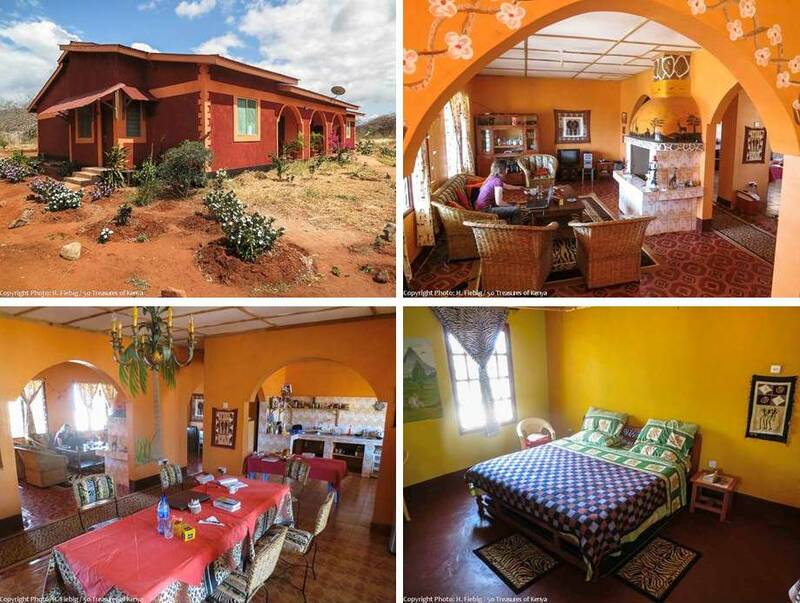 Do you have to be a soothteller to know that Tsavo East holds a real treasure? 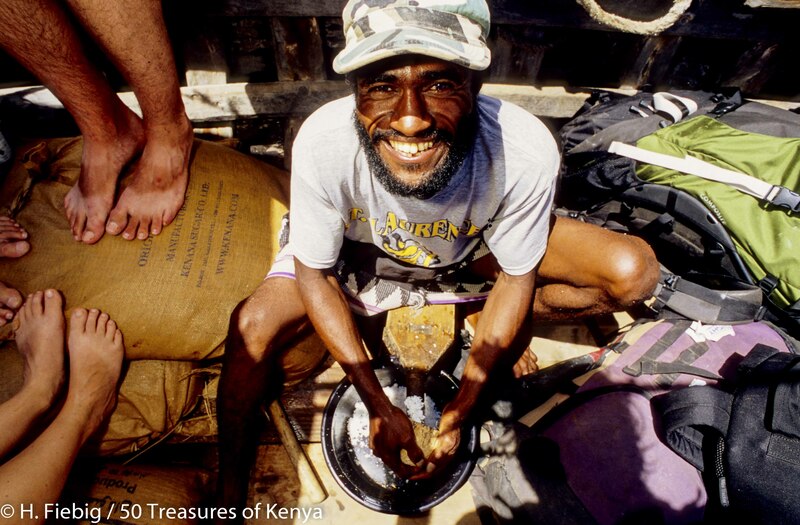 A treasure which is getting more and more precious in today’s Kenya? The Yatta Plateau is the world’s longest lava flow which stems from Ol Donyo Sabuk mountain near Nairobi and stretches more than half way down to the coast. What we see as an impressive single table mountain in fact consists of a former riverbed which was covered by a huge lava stream. Yatta Plateau is very impressive – obviously more for its sheer stretch of 300 kilometers, making it the longest lava stream in the world – except for its height. As the soft surroundings eroded over the course of time, the lava stood out as a towering elevation, which offers stunning views of Mt. Kilimanjaro, the Chyulu Hills, Ngulia Range and Athi River from above. Because of its porous lava rock, there is hardly any water found on top of the plateau. This again has led to specific drought resistant forest vegetation. The main track from Galana River to the Northern HQs climbs the Plateau and offers nice vistas of the Yatta. 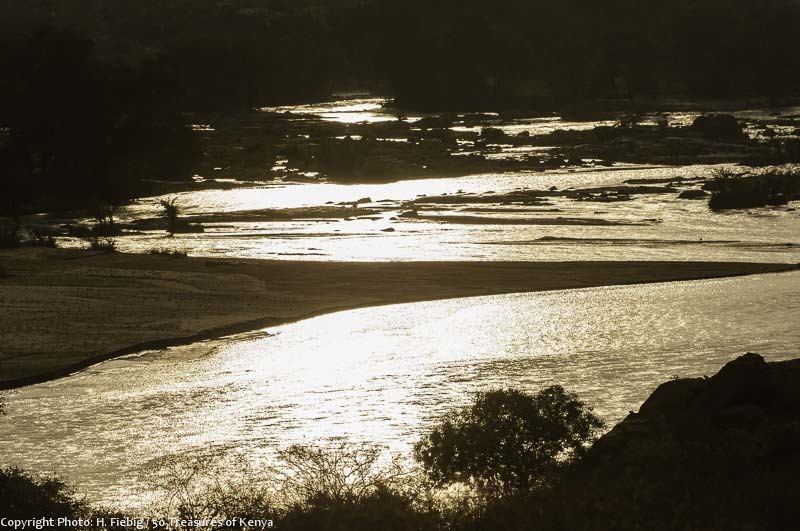 The riverscapes of Athi, Tsavo and Galana River become a glittering attraction when the sun comes near the horizon. The drive along the northern banks of Athi River is one of the most scenic, wild and serene experiences you could possibly imagine. It offers ever changing riverscapes and plenty of wildlife encounters and no other cars. You can be sure of seeing hippo, crocodile and plenty of plains game coming to the river for drinking. 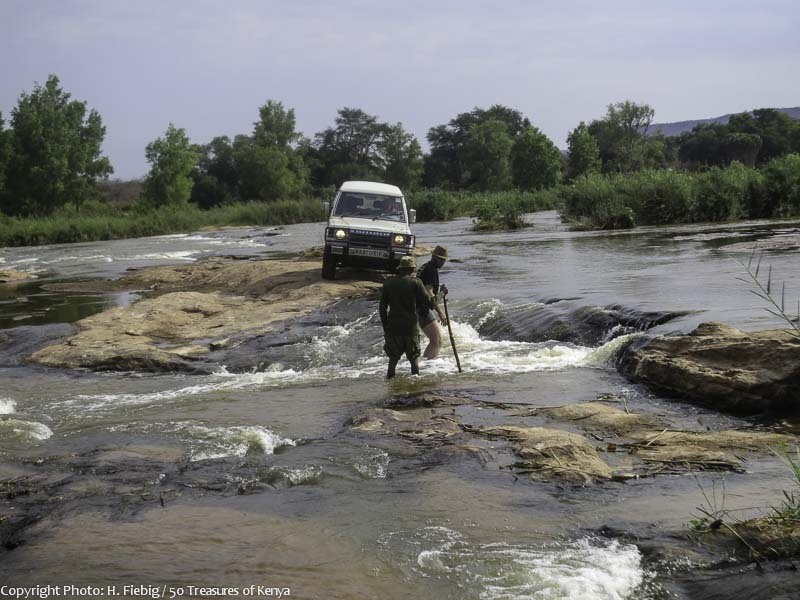 The stretch from the ford close to Tsavo Safari Camp to the main river crossing measures 70 km and can fill a whole day. 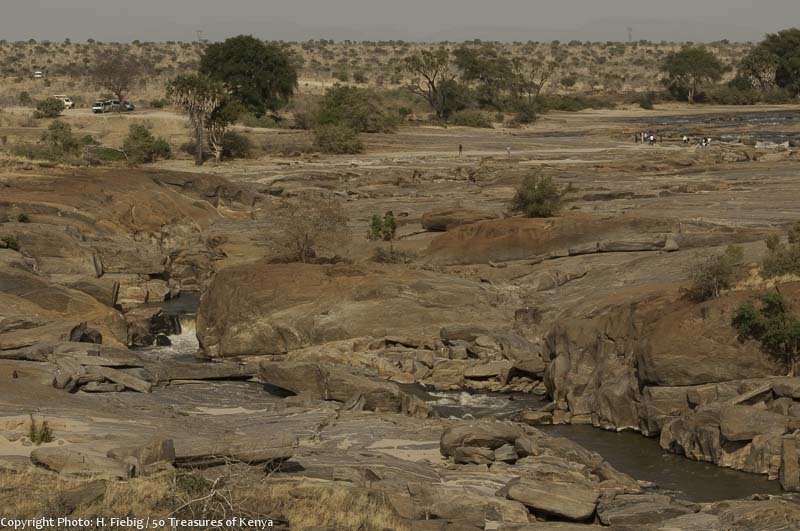 At kilometer 45.7 km from the Athi River Crossing, or 46.7 km from Tsavo Safari Camp, the river squeezes itself through a narrow rock bed which looks like an artificial channel although its of natural origin. Think twice before looking for a refreshing bath in the waters of the Athi and Galana Rivers. You might end as a croco snack. Some specimen really have impressive jaws. 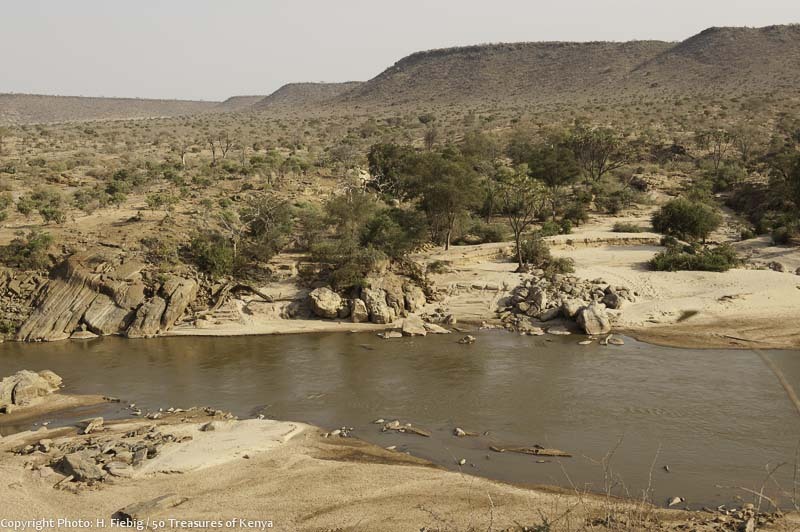 The merging point of Tsavo River, which stems from Mt. Kilimanjaro and Athi River, which sources in the Nairobi region, is the birth place of Galana River, which is Kenya’s second longest after Tana River. The merger lays just a couple of kilometers downstream from the famous Tsavo Bridge, where two man eater lions brought the construction of the Uganda Railways to a halt for almost a year. The site, which is guarded by impressive crocodiles basking on the shores, can also be visited from the south side of the river. Some people call Mudanda Rock ‘Little Ayers Rock’ which surely is an overstatement. Still, Mudanda Rock and the natural dam below are worth a visit. A rewarding destination is Mudanda Rock which is found north of Voi Safari Lodge between junction 158 and 112. It is almost 2 km in length, 20 m high and about 50 meters in width. It is composed of ancient bedrock and rises abruptly from an otherwise perfect plain. It can be climbed from the west and opens a view to the east, where the rock plunges into a natural dam which is fed by the runoff water. In an otherwise dry surrounding this attracts many animals which can be well watched from the top. If you are lucky, you will see a bathing elephant herd. 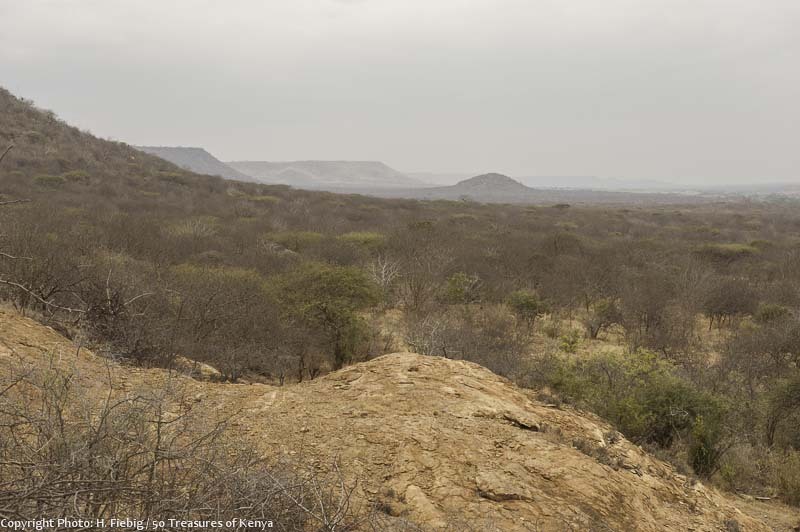 To the north of Mudanda Rock, between junction 170 and 150 stands Observation Hill, which offers great panoramic views over the location of the merging of Athi and Tsavo Rivers and Yatta Plateau. As you follow Galana River downstream from junction 160 which leads to the river crossing, there is another branch-off which takes you to Lugard Falls which are rather rapids then falls. During the past thousands of years, the river has chiseled a small cut through a massive bar of bedrock. During the rainy season, the hissing and foamy floods offer a thundering spectacle. Galana River squeezes itself through a belt of rock to form Lugard Falls. In the dry season, you can climb on the rocks which resemble a collection of weird sculptures, cut out and polished by water. The falls are named after Frederick Lugard, who passed this place on his way to Uganda, which he brought under the control of the Imperial British East African Company. He was made a lord for his successful unification of the huge colony of Nigeria from 1912–14. Crocodile point lies just below Lugard Falls. Probably, the crocs are attracted by the fact that dizzy fish must be an easy catch?! Just below of Lugard Falls lies Crocodile Point, which you reach through junction 163. From a cone of about 50 m you enjoy an unobstructed view of the treacherously calm waters which are populated by bathing hippos. 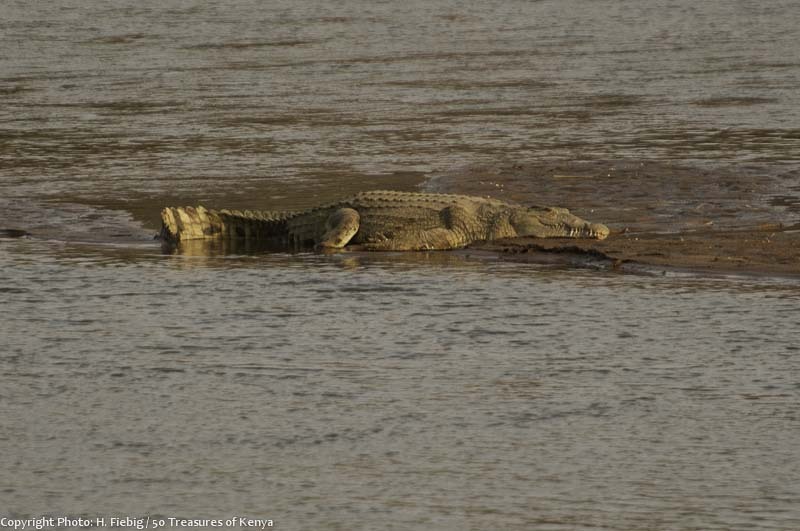 Huge crocodiles lie on the beach in the sun to digest their previous fish meal. Buffalos at a wallow below Voi Safari Lodge. Coming from Voi Gate, you can follow the mostly dry riverbed of the Voi River. However, the green vegetation on its banks and many water holes attract a lot of animals from the dry surroundings. Especially during dry season this is the spot to watch birds, monkeys, elephants, gazelles, lions and leopards. Exceptionally rewarding are often the River Loop and Wanderi Swamp Loop. Aruba Dam pools Voi River, forming a small lake which lures thirsty animals from Taru desert. A viewpoint reached over junction 140 offers a nice view over Lake Aruba and its hippos, Aruba Ashnil Lodge and the hills at the fringes of the national park. Luckily, Tsavo Safari Camp – one of the very few accommodations in the northern sector – is not pretending to be a boutique hotel, but lives up to its name. 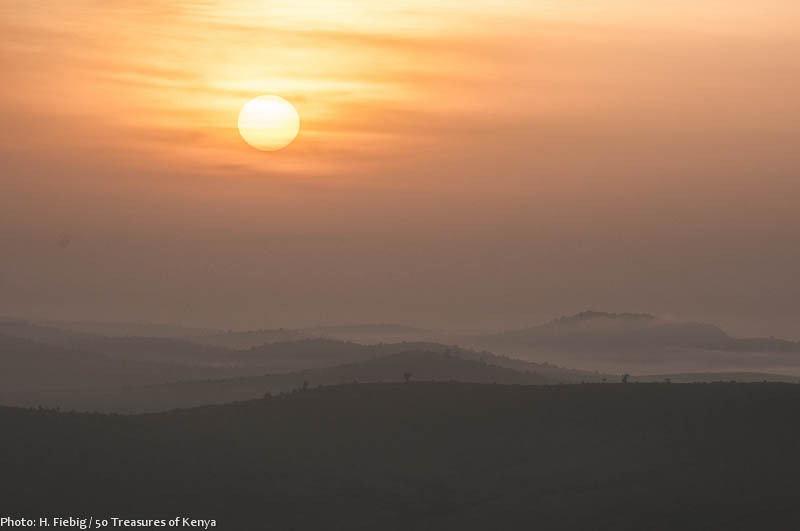 Founded as a hunting base under the name of Kitaani kya Ndundu, it became one of the earliest established tented camps in Kenya associated with famous adventurers, such as Glen Cottar and renowned photographer Peter Beard. Vistas of Tsavo Safari Camp. It is a true safari camp in the middle of a huge wilderness! 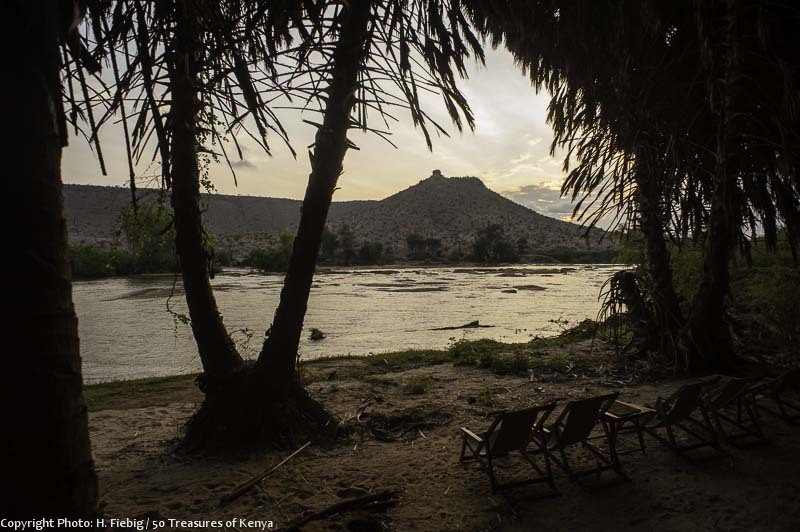 The 18 tents lie in the shade of raphia palms, right on the Northern banks of Athi River. Although surrounded by absolute wilderness, guests don’t have to refrain from any comfort. Apart from the big beds made of natural wood, the interior is rather descent, but the bathrooms at the back are spacious and friendly and there is even a swimming pool. Lounge and restaurant are placed in a huge open shade which is furnished comfortably. When coming the 30 kilometers from Mtito Andei by car, you have to ford Athi River or you park the car on the other side of the river and a boat brings you over to the Camp, which also owns a private airstrip. Activities offered comprise of day and night game drives, bush meals, sundowners, birdwatching, fishing and excursions to Sheldricks’ Blind at the top of Yatta Plateau. The camp is children friendly and offers specific activities for them. Epiya Chapeyu is somewhat a budget option on a full board basis, idyllically situated at the sandy banks of Galana River inside a palm tree forest and run by friendly staff. The camp owns 17 comfortable but rather simply furnished safari tents with toilet, sink and shower plus one bungalow with a double bed. Vistas of Epiya Chapeyu Camp. As the owner is Italian, the food served on the veranda of the restaurant is excellent. There are hippos in the river and two resident elephants which wander through the camp at night, but no swimming pool. 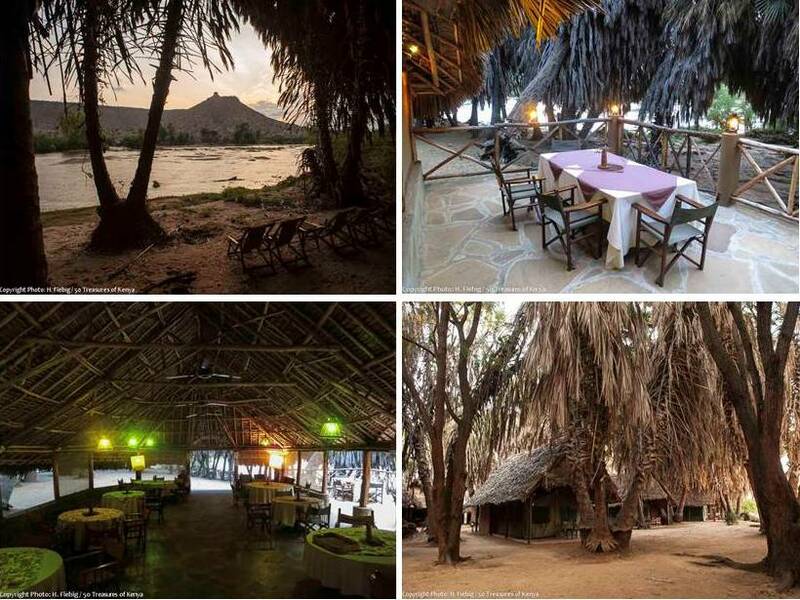 Galdessa Camp is sitting on the southern banks of Galana River facing Yatta Plateau, where you enjoy palm shade, a gentle breeze and a scenic view of the river. What makes Galdessa Camp outstanding, is the attention which has been put into the interior of the public lounge, the 12 spacious safari tents on wooden platforms and three exclusive bandas, which can be rented only by one party, granting absolute privacy. Materials from the surrounding, like an impressive hippo skull and weird deadwood have been combined into a piece of African chic, which is very comfortable, stylish and exclusive. Having an Italian owner and a manager from Seychelles, good food and beverages are given the proper attention. The camp has a laid back philosophy: As much as service, interior and food are given its attention, the major attraction is serenity and the pleasure to sit above the river as you watch waterbuck, the resident elephant by the name of Mugabe, the local hippo clan or read a good book. Walking safaris are offered in the afternoons. The camp is not fenced to ensure a real wilderness feeling. There is no swimming pool. Voi Safari Lodge, being one of the very first lodges of the country, has gotten a history that reaches back into the 1960s. If it was built today, its motel like outside would probably have been given a different look. It has gotten 53 rooms on three floors which are rather small but have been renovated recently and are equipped with a fan and mosquito net. Vistas of Voi Safari Lodge. 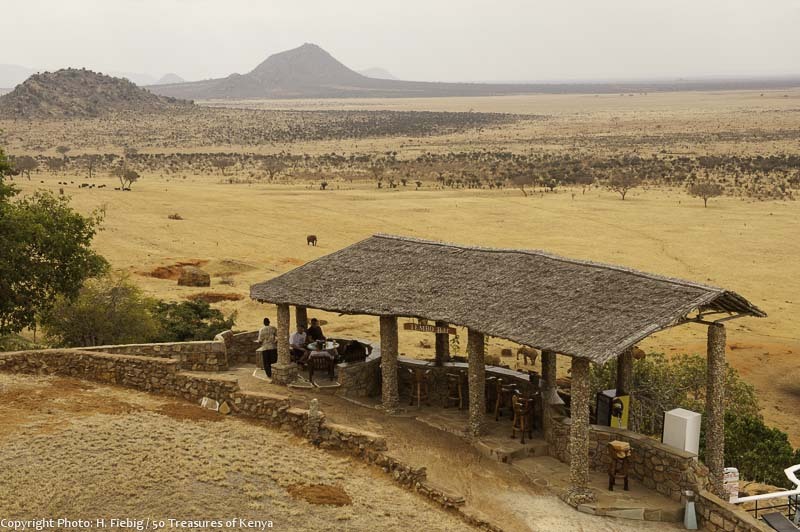 This place clearly stands out for its spectacular view down to a waterhole well frequented by huge elephant and buffalo herds, and over the endless plains of Tsavo East. You will enjoy the view also from the rooms, the swimming pool area with its Tembo Bar and Ndovu Restaurant. It clearly is the place to come for a swim and possibly a sundowner, as you gaze into the indefinite distance. 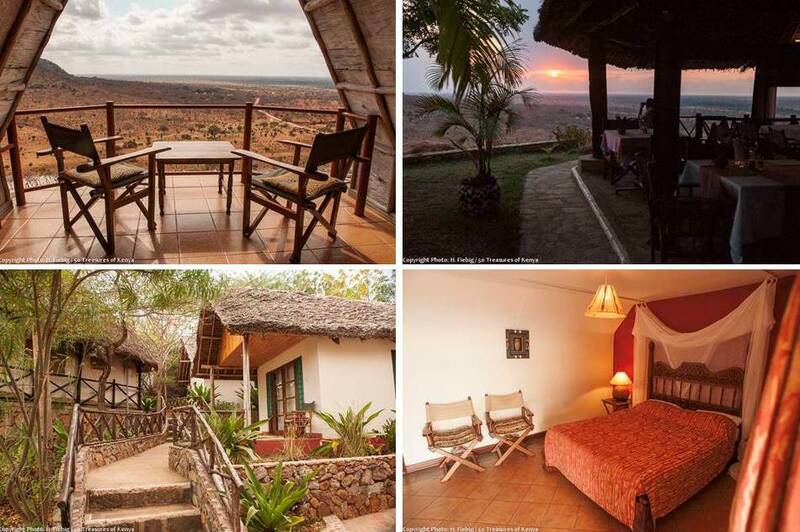 Located on the top of a hill just before you enter Tsavo East’s Voi Gate, Lion Hill Lodge undisputedly offers the most spectacular views of all accommodation in and around Voi. On one side, you look down to Voi and Sagalla Hills in the distance. On the other you peep deep into the national park with huge herds of buffalo and elephant passing below, as you hear their sounds carried up by the wind. Vistas of Lion Hill Lodge. Lion Hill Lodge offers 12 spacious, friendly rooms, all having nets, vans and a terrace with the striking view to the national park, two spacious safari tents and a set of family cottages. A spacious pool currently is under construction and should be finished towards the end of 2013. The team is friendly, the location superb, prices are fair – it doesn’t get much better than this. Anna Biberstein, the good soul of Sagalla Homestay, is the initiator of the New White House Academy, a boarding school for orphaned children, right on Mombasa highway some 4 km out of Voi. The Swiss lady has opened her home for travelers who don’t need fuss like a warm shower, but cherish a private atmosphere in colorful surroundings, excellent food and hearty company. There are only three rooms and space for camping in the garden. Rates are very favorable and include breakfast. There is wifi and an extensive library. Anna is happy to show people the impressive work of the White House Academy and helps with organizing trips to Tsavo East and the Sagalla Hills. Because of the highway passing close by, traffic might be heard in the rooms of the front side. 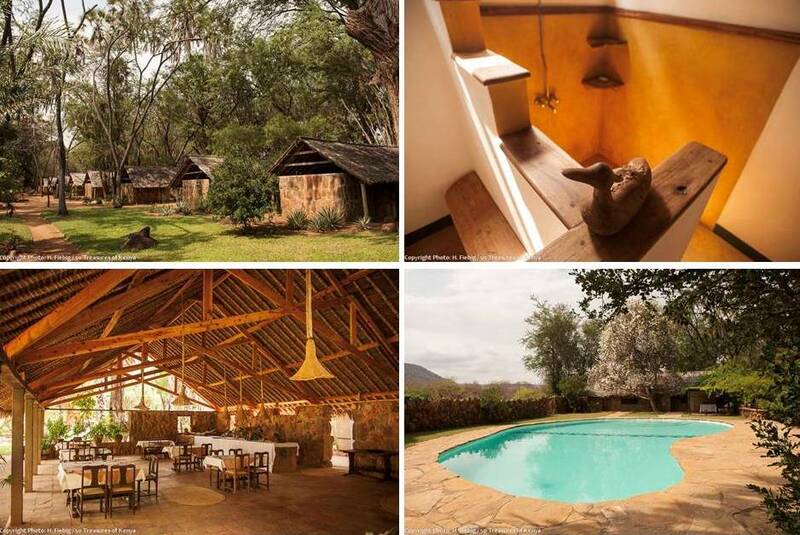 Ngutuni Lodge lies at the Southern fringes of Tsavo East, inside the private Ngutuni Game Sanctuary bordering the national park. The lodge comprises of two wings with 24 spacious double rooms each, including 16 rooms with interconnecting doors for families. The interior lacks a bit of a personal touch, but rooms are spotlessly clean and have a veranda facing a watering hole which is frequented by herds of buffalos and elephants. 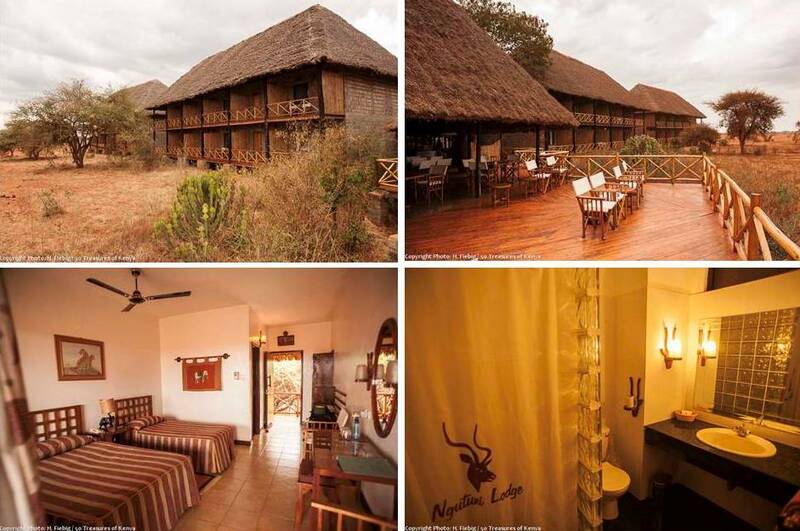 The premises is very well maintained and offers attractive lunch packages for people traveling on Mombasa Highway, as the lodge is situated only 7 km off the tarmac. Pre-booking is required, though. 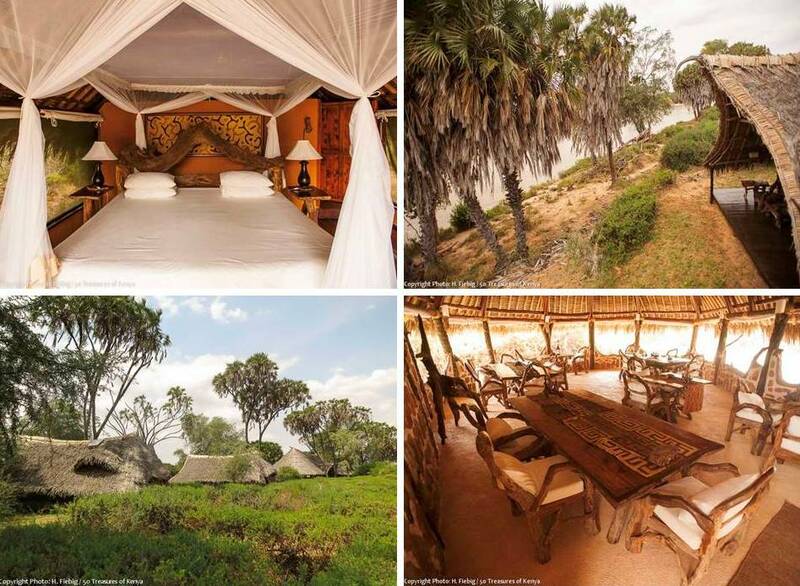 Satao Camp, http://www.sataocamp.com, is situated at the banks of seasonal Voi River. Creative makuti and dead wood architecture give the camp a special feel. Camp and safari jeeps are equipped for wheelchairs. •Sentrim Tsavo, www. sentrim-hotels.com, is a fairly priced, rather simple camp, which lies under shady trees. •Ashnil Aruba Lodge, www.ashnilhotels.com, lies at the fringes of Aruba Dam and offer luxury bandas as well as safari tents on a fenced of compound. •Man Eaters Lodge, www.voiwildlifelodge.com, stands on historc grounds, right on the banks of Tsavo River. The choice of public campsites in Tsavo East is somewhat limited, currently they are only three. You can camp at Sala Gate and there are two public campsites close to Voi Gate, namely at Kanderi Swamp (junction 173) and the shady Ndololo Campsite (junction 137), which offers showers and a toilet. Restaurant and Bar of Ndololo Camp are just a few steps away. All safari camps and lodges have restaurants, some however are only open to guests who stay at the premises, such as at Epiya Chapeyu or Galdessa Camp. If you are in the southern sector, it is an option to leave the park for lunch at one of the many restaurants of Voi before re-entering. 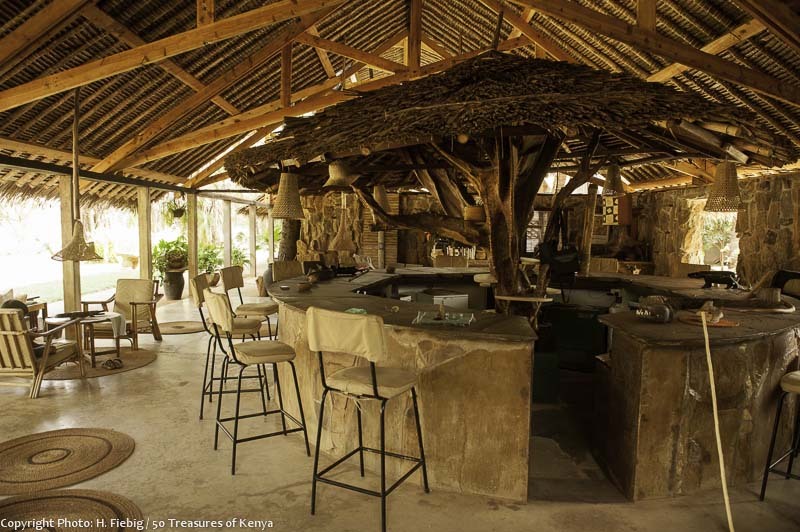 If you are not going for the wild style and drink your own supplies somewhere at the riverbanks, Tembo Bar of Voi Safari Lodge is a decent place for a sundowner, as it sits right over a water hole which is frequented by huge herds of elephants and buffalos. All major tour operators offer trips to Tsavo East. Southern Cross Safaris (www.southerncrosskenya.com) and Lofty Tours (www.lofty-tours.com) have proven to be knowledgeable and reliable. They also have car rental for self-driving. Welcoming spirit at Mtito Andei Gate of Tsavo East National Park. Entry fees: The entry fees to Tsavo East are as follows: Citizens: Ksh 500 (Adults), Ksh 200 (Children/Students), East African Residents: Ksh 1000 (Adults), Ksh 500 (Children/Students), Nonresidents: US$ 65 (Adults), US$ 30 (Children/Students). Vehicles up to 6 seats are charged Ksh 300, and above . Tsavo East and Tsavo West can only be entered with a KWS Safari Card which has to be loaded in advance with the entry fees. 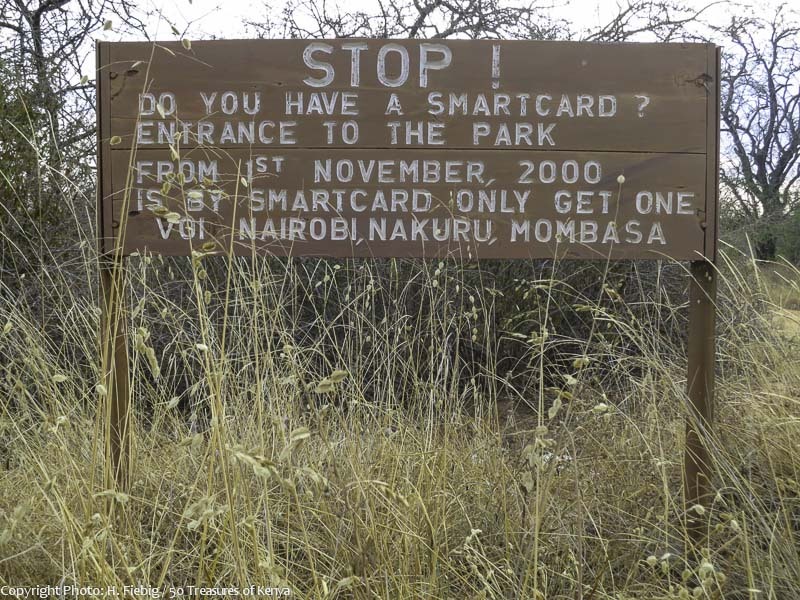 Safari cards are obtainable and chargeable at Tsavo West’s Mtito Andei gate, merely 400 m off the Mombasa Highway and at Voi gate. There are five major gates to the park namely Mtito Andei Gate, which is rarely used because of the delicate river crossing, Manyani Gate, which is preferred by people coming from Nairobi. There is Voi Gate which is just at the fringes of Voi town, Buchuma Gate, which is the closest gate to Mombasa and Sala Gate, which is the appropriate access when you approach the park from Malindi. The park is open from sunrise to sunset, driving around the park after dark is prohibited. Best travel time: Tsavo East can be visited all year round. However, during rainy season, some of the tracks might be impassable due to mud or flooding. Best conditions for watch animals are found during the dry season, when the game is lured to the riversides and water holes. 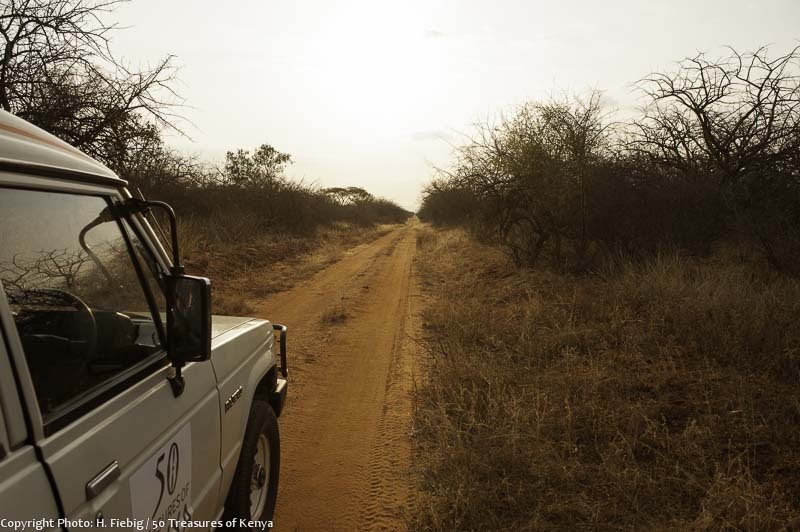 Tsavo East is of incredibly vast extent, distances and travel times must not be underestimated. But tracks in generally are well maintained, although on some stretches there is quite a bit of corrugation. The southern part can also be visited with a saloon car. The park is equipped with a proper system of sign boards which bear numbers. When obtaining the recommendable Tsavo East National Park tourist map on sale at Voi gate, you can hardly get lost, as it also shows the junction numbers. However, some of the marked tracks disappeared as they have been reclaimed by wilderness, especially in the northern part. Distances in Tsavo East are huge! Better remember if you want to make it home before dark! There are only three fords crossing Athi and Sagala River, respectively: At junction 160, which is well built as it is on the main road to the Northern Headquaterss, at junction 177 (this is the wild one described above) and close to Sala Gate. Please note the security advice below before crossing the fords! Beware of the huge distances in the park otherwise you might be caught unprepared by nightfall. From junction 100, right after Voi Gate, it is 27 km to Aruba Lodge, 69 km to Buchuma Gate at the Southernmost tip of Tsavo East, 88 km to Sala Gate and 193 km to Malindi, 41 km to Lugard Falls at Galana River, 37 km to Mudanda Rock and 153 km to the Park Headquaters at Ithumba. Tsavo East, especially its Northern part, is a real wilderness. Make sure, you don’t go unprepared when you are on a self-drive basis: Take two spare wheels and tools to change, make sure you have enough petrol and mind to take enough drinking water. In many parts of the park, there is no mobile reception. When you are getting out of the car make sure, you don’t bump into lions, elephants or other wild beasts. This is specifically true for the riversides with its massive crocs. Swimming in the river is suicidal, as tempting as it might look. Be extremely careful when crossing Athi River, respectively Galana River and the fords are flooded. You wouldn’t be the first to be washed away with your car and get killed. So show patience until the swelling of the river is over after the rains.Certain parts of the park have a lot of tsetse flies, which are not a danger but a serious nuisance. Keeping your windows closed will be the only way to keep them out. There is a recommendable map about Tsavo East sold in the KWS shop at Voi Gate. Another attractive tourist map (scale 1:50,000) is available in the bookshops around the country which has been released by Sapra Safari Publishers. It is however not always 100 % correct and lacks some clarity, especially in those regions with a densely knit network of tracks. The well known American photographer Peter Beard has done a gripping if not shocking book titled ‘The end of the game’ about Tsavo’s elephants starving in the thousands during the severe droughts in the 1960s and 1970s. Possibly the most touching shot shows an elephant battered to death by a giant baobab it had felled to reach the few leaves at its top. We trust that this feature has been informative to you. If indeed, please take it a step further and spread the message, like it, share it and follow us as we countdown to Kenya’s 50th birthday! Like us on Facebook, Follow us on Twitter and stay posted for the next Treasure. Please contact us if you require further details on how you can get to visit these wonderful places. Perhaps you too have a view, comment or article you would like to share with our audiences. Kindly send us an email or drop us a note in the comment box if you would like to make your contribution(s) on our blog. We will be delighted to publish them along with our regular features as long as they focus not only on the affluence of Kenya’s treasures but their influence as well. Until the next time its many thanks from the 50 Treasures of Kenya Trust to all the contributors in this feature with special acknowledgment going to our chairman Mr.Harmut Fiebig for the wonderful photography and most of all to you our treasured audience for your delightful company. Its always our pleasure to share a treasure. Slum tourism : Defaming Africa ? 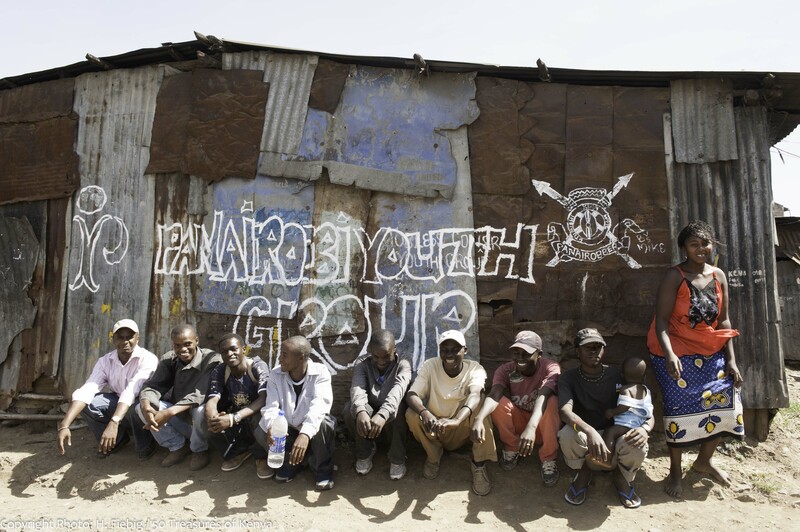 ‘I am so tired of white people coming here to look at us like monkeys in a zoo…’ these are the words of Mama Otieno to Mr. Onyango, a tour guide who had taken us on a slum tour at Mathare slums, Nairobi-Kenya. I did not understand the local dialect that she had used, but I asked him to interpret for me since the look on Mama Otieno’s face was not a happy one when she saw us. This really got me thinking especially as we continued walking through the murky waters, escorted by a pack of fleas and ugly sights of raw sewage on the sides of the narrow footpaths. The slum area reflects a clear perception that many people from the West have when they imagine life in Africa. Poor people, hungry and dirty children, a dire need for aid, lack of infrastructure, insecurity and lack of education resulting in high unemployment rates are just but the words that many Westerners can use to describe Africa, and this was very clear in the slum area that we visited. Reflecting on Mama Otieno’s words, does slum tourism defame Africa ? Does it mean that slum tours tend to turn poverty into entertainment for tourists ? Its clear that she was not impressed that we had come to see her small house with a roof that was ripping apart and taking pictures of her dirty children playing near sewage water. She might have felt that tourists come to invade on her privacy as she regards herself as a monkey in a zoo! Tourists who visit slums do walking safaris, through the many footpaths, with the help of a tour guide who is mostly a person from the slum area. During these tours they like to take photographs of everything they see as they are amazed by this other kind of life that they have probably ‘never seen’. One would wonder whether they are enjoying taking pictures of poor people who are struggling in order to make ends meet! Slum tourism is a special kind of tourism that for a long time has been looked at as an exploitative kind of tourism whereby tourists travell all the way from their home country to have fun taking pictures and looking at poor people struggling to make ends meet. Promotion of this kind of tourism tends to portray Africa as a pitiful continent whereby those that visit the continent are convicted to donate money to the people. 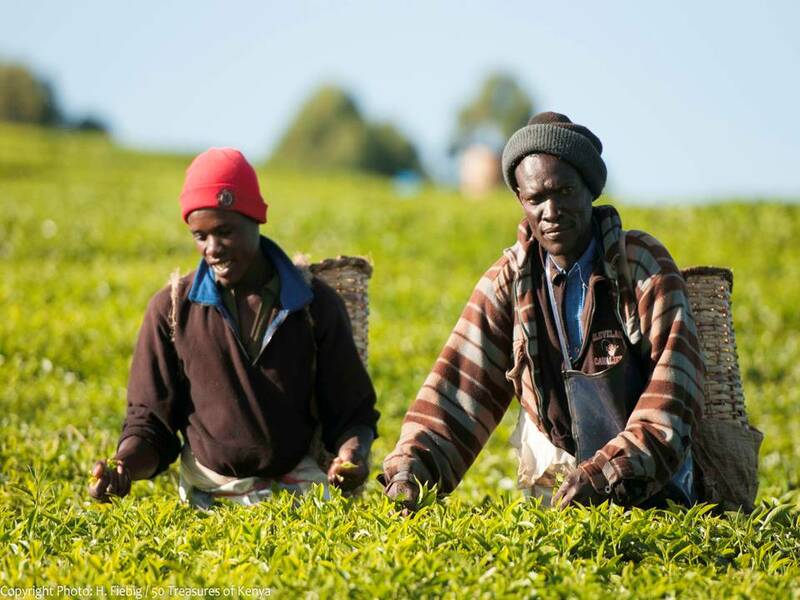 Africans tend to be looked at as a helpless people who cannot develop themselves without receiving aid either from China, US, Russia or the UK….This is a perception that certainly has to stop!!! There is something that slum tourism does not show to the visitors….how hard many of the slum dwellers work to be able to make an honest living because some of those who live in the big houses and drive expensive cars are involved in illegal activities to be able to maintain their expensive lifestyles. Suzi, another friend of mine from Austria, has set up a small organization in Mathare slums that helps children be able to access a good education and a home away from home in her orphanage. She suggests what I certainly think is the best solution to this problem, turning slum tourism into voluntourism. This involves people coming to live among the locals for a certain period of time, familiarise themselves with the people and create a good rapport with them instead of randomly taking pictures of residents. Visitors coming to these areas for their first time and feel compelled to contribute in the development of the area have to first stay with the people, feel accepted and then involve the locals fully in whatever developments they want to undertake. Moreover, travel agencies operating slum tours in these areas should also train and employ the locals living in the slums so that they can be able to earn a living out of the visiting tourists. With time, the local people will start to see the benefits of having visitors coming to stay with them, learning things from one another hence be able to embrace them as friends and not people that come to take pictures of them like monkeys in a zoo. Does slum tourism defame Africa ? That his hours were running fast. We couldn’t believe he was dead. We take this chance and celebrate all our heroes today. Heroism is an ideal. Look around and the person that inspires you to be the best you can be, in whatever way is a HERO. Nairobi, in spite of it all, is still the safari capital of Africa even though the modern world has caught up with it speedily. 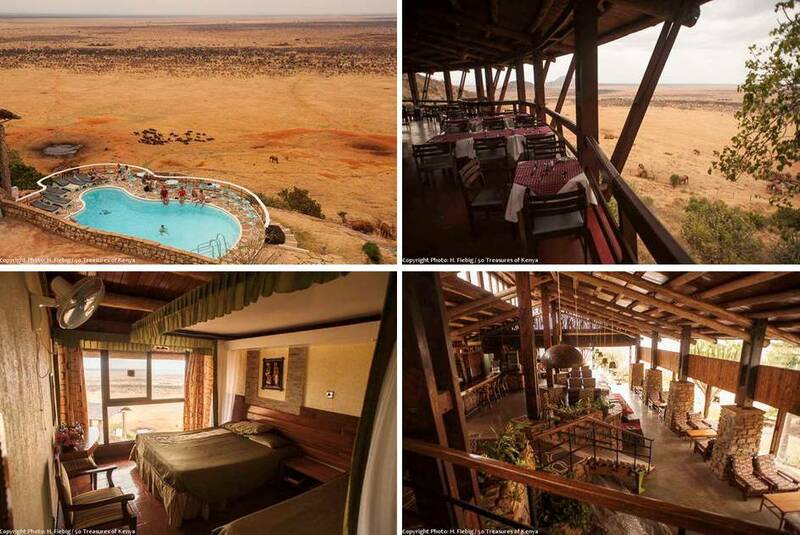 A boondocks no more, this bygone Maasai watering hole will do more than wet your appetite. 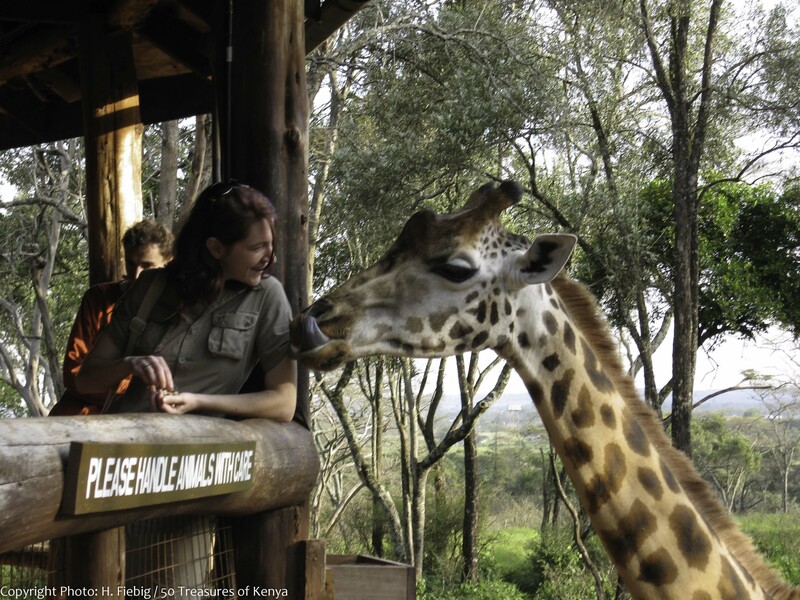 Nairobi is sleepless, energetic and contempo, offering an impressive introduction to both wildlife and nightlife. Its music clubs pulsating with vivacity, bustling shops and spirited markets alongside a mélange of ‘food joints’ will certainly tempt your palate. The name “Nairobi” comes from the Maasai phrase, Enkare Nairobi, which translates to “place of cool waters” probably borrowed from the Nairobi river, gave the city its name. In addition to being a favourable site for the Nairobi railway camp, it was also chosen because of its network of rivers and temperate elevation. Furthermore the location ‘s central position between Mombasa and Kampala made it the ideal residential choice. 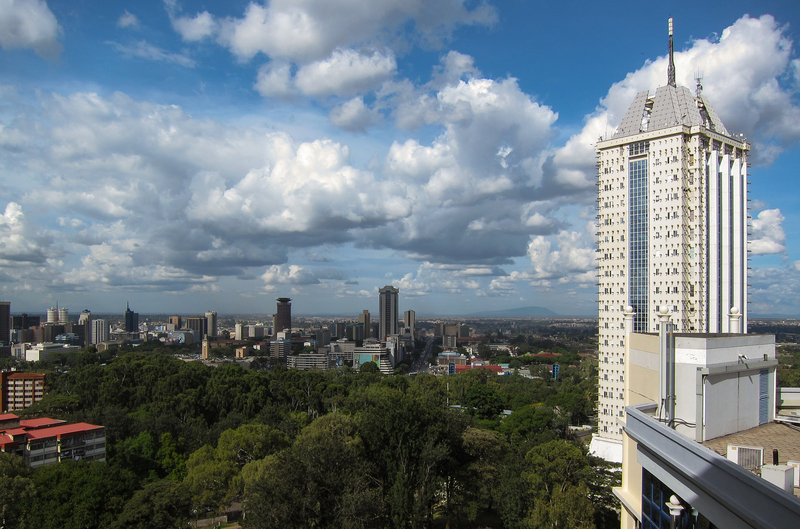 Although Nairobi is now thriving as one of Africa’s largest and most intriguing cities. This area was essentially an uninhabited swamp until a supply depot of the Uganda Railway, which soon became the railway’s headquarters, was built here in 1899. Not long afterwards, the town was completely rebuilt in the early 1900s following an outbreak of plague and the burning of the original town. In 1905, Nairobi replaced Mombasa as capital of the British Protectorate centered around administration and big game hunting. However its disadvantage as malaria prone area, it prompted the residents to attempt to have the town moved. Nonetheless it continued to grow under the British occupation until it eventually became the capital of a free Kenyan republic in 1963. 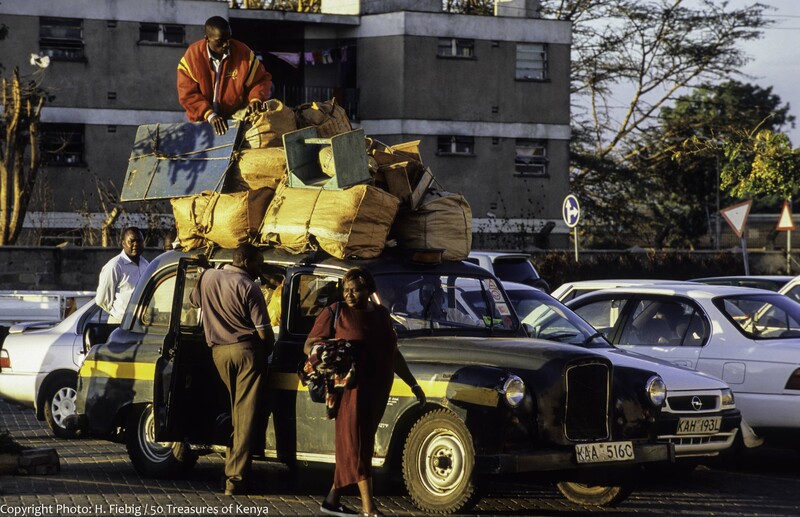 Nairobi as we know it today, is as contemporary as its people. An established hub for commerce and culture it can surely be defined as a prominent social center. This is a place of great contrasts where race, tribe and origin all contribute to its unmatched character. 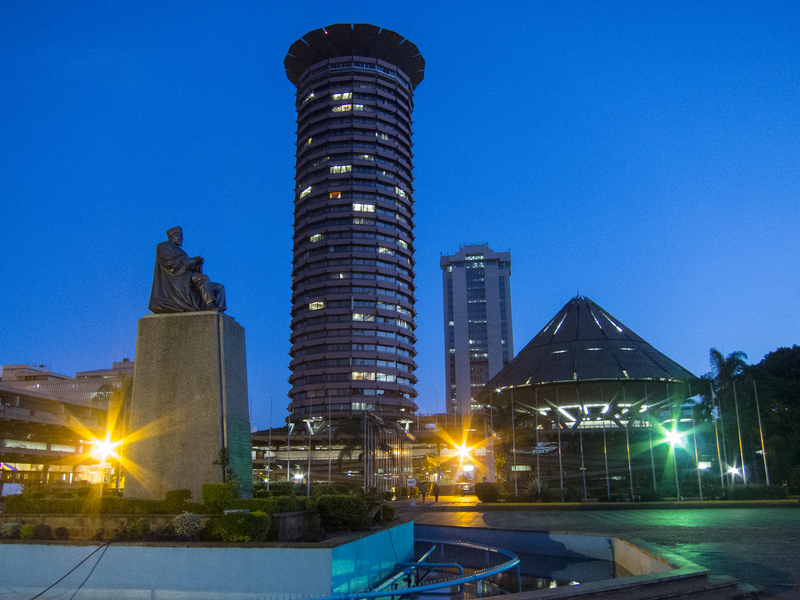 Enduring as a cosmopolitan and multicultural city, it has grow around its central business district ranking it as the most populous city in East Africa and the 12th largest city in Africa. 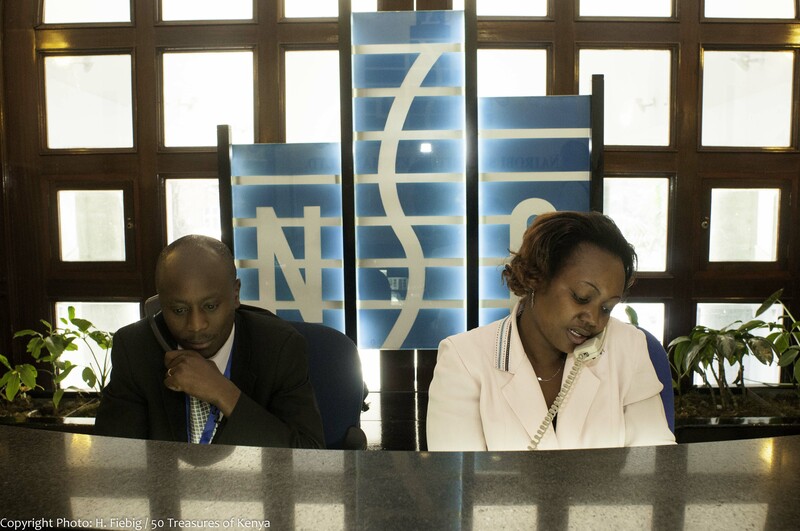 Over 90% of Nairobians work within the CBD, in the formal and jua kali sector. One of the most influential cities in Africa both politically and financially with the second oldest exchange and one of the largest in the continent. It hosts thousands of local businesses and over 100 major international companies and organizations. Nairobi also boasts as the regional headquarters of several international companies and organizations including the UNEP and UN-Habitat headquarters. Many come to Kenya for a safari oblivious to the fact that you barely need to leave the capital to take one. The city in itself does have several tourist attractions although it may lack the appeal as a prime tourist destination. Most famous naturally is the Nairobi National Park which contains abundant wildlife making it a non-stop thrill ride of a wilderness excursion. Established back in 1946, this is Kenya’s first National Park and is really unique being the only game-reserve of this nature to border a major city. 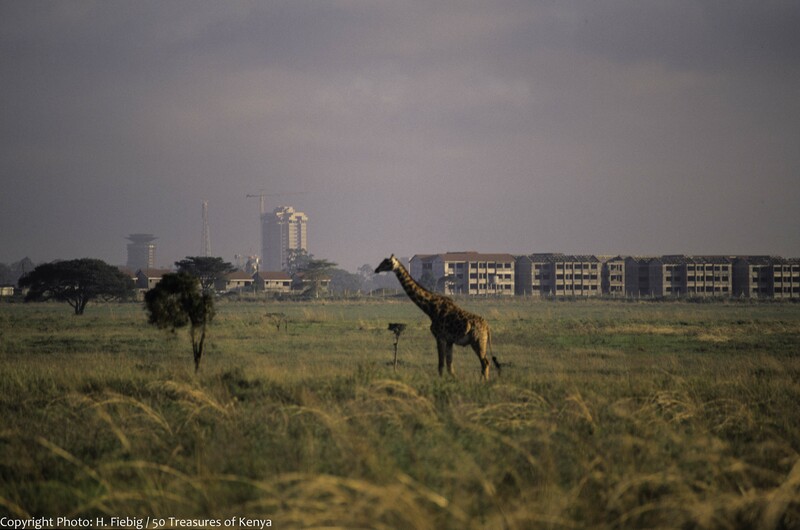 There’s plentiful wildlife, including most of the plains animals (except elephants), against the bizarre backdrop of Nairobi skyscrapers. Approximately 7 km south of the city centre, this phenonmenon is perhaps the only wildlife park in the world that you can visit by taxi or bus. 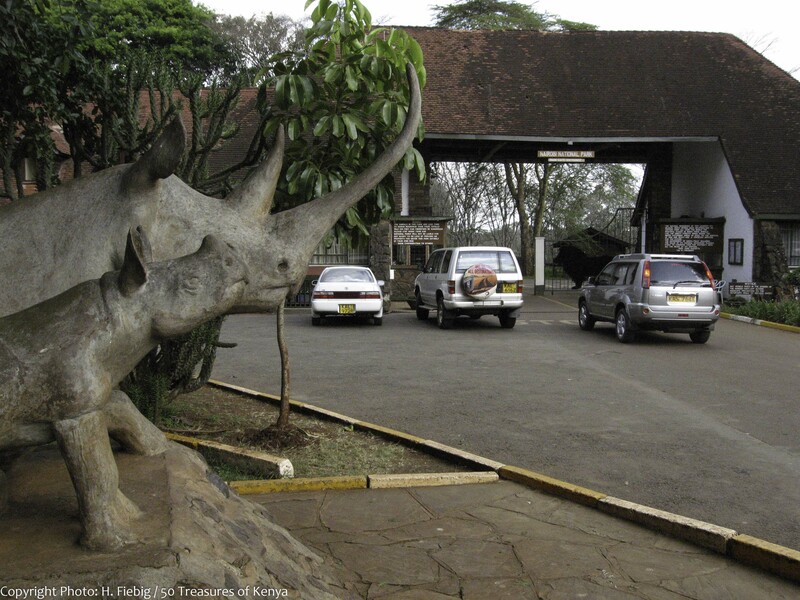 The Park is open daily from 8:30 a.m-5:30 p.m. and is easily accessible on tarmac roads, mainly through Lang’ata Road. It is particularly ideal for travelers with stop-overs in Nairobi or those in Nairobi for business without the luxury of time for a long safari. The afternoons area best time to visit. Covering an area of 117.21 km2 , it is relatively small in comparison to most of Africa’s well known national parks. The park contains two major ecosystems comprising of highland dry forest and savannah which feature a wide range of natural and artificial environments. Its predominant environment is open grass plain consisting mainly of savannah with scattered Acacia bushes and grass plains. There is a riverine forest along the south of the park that is drained by permanent rivers. Dams have also been set up on secondary rivers to disperse water over the plains and wetlands. The western side is highlands are covered by dry forests and dense riverine vegetation with Wild Olives, Crotons and Cape Chestnut trees. In the grassland on lower slopes are species like Red grass, Crab grass and Bermuda grass with scattered Cypress and yellow-barked Fever trees. There are also some areas of broken bush and deep rocky valleys and gorges within the park. The species in the valleys are predominantly Acacia and Euphorbia candelabrum. Other tree species include White pear, Fig trees, Canthium shrubs, Sumacs and some legume species. Several plants like Spurges also grow on the rocky hillsides and are endemic to the area. Serving as the northern limit for wildlife migrations, the concentration of wildlife in the park is highest when areas outside the park have dried up. The dams in turn have created a wonderful man-made habitat for myriads of birds and various aquatic animals. 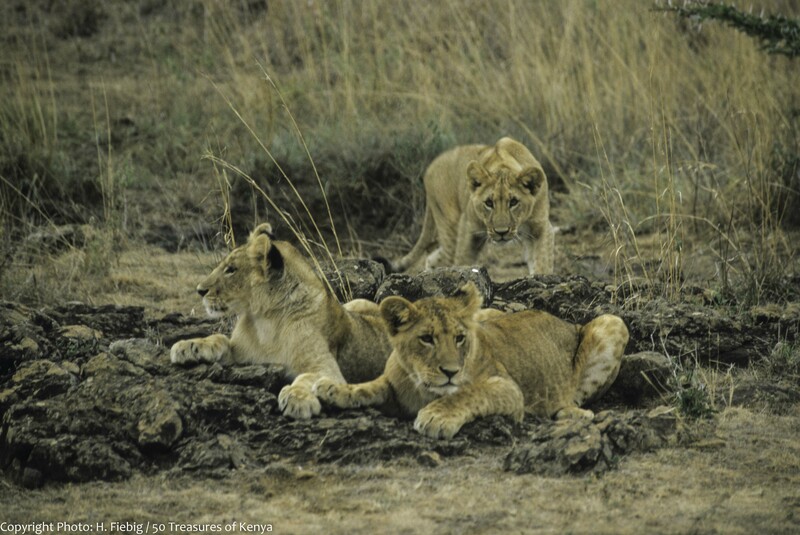 Its diverse wildlife population, includes one of the highest densities of lions in the country. 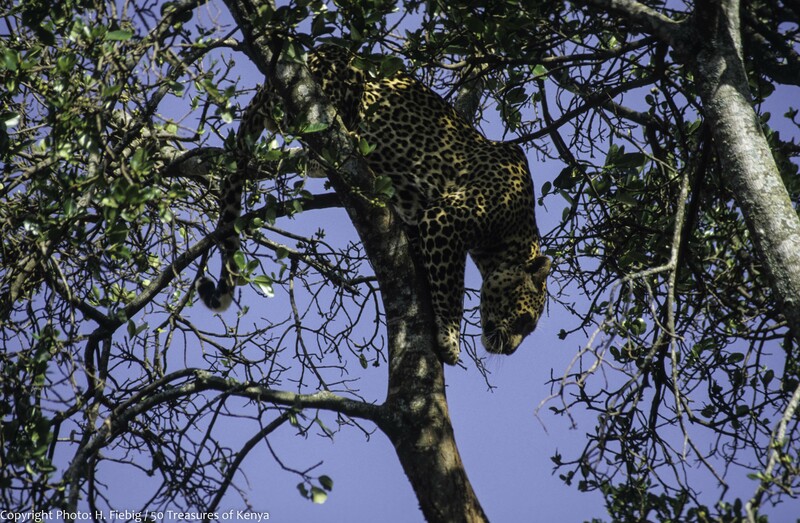 Other member of the Big 5 found in the park include the African buffalo, leopard and rhino. There are also hippopotamus, cheetahs, baboons, Burchell’s zebra, Coke’s hartebeest, Grant’s gazelle, Thomson’s gazelle, elands, impala, Masai giraffe and waterbucks. It also has a high diversity of bird species of up to 500 permanent and migratory species. It is also one of Kenya’s most successful rhinoceros sanctuaries. True to its moniker, the Kifaru Ark is one of only a few parks where visitors can be certain of seeing a black rhinoceros in its natural habitat. Another sanctuary within the park is the David Sheldrick Wildlife Trust, located close to the park’s main entrance, where between 11 a.m. and noon you can watch keepers take orphaned baby rhinos and elephants for their daily mud baths. 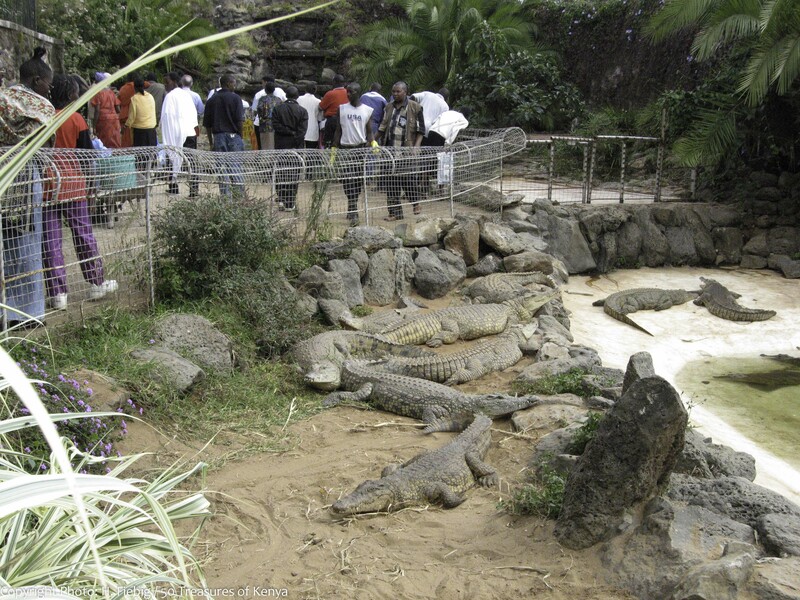 Another major attraction in there is the Nairobi Safari Walk as it offers a rare on-foot experience of the animals. This is one activity that gives you an chance to see Kenya’s wildlife close hand rather than from the restrictions of a tour van. It is an exciting eye opener to Kenya’s Parks and Reserves that offers visitors an opportunity to discover and anticipate what is out there across the country. Other attractions in the park are the animal migrations in July and August, the Ivory Burning Site Monument and Nairobi Animal Orphanage. Established in 1964, it is the oldest animal shelter in Kenya and rehabilitation centre for abandoned or injured wild animals. Secured within the park’s lush landscape, this special facility is home to more than 20 different animals and bird species. Nairobi is surrounded by several expanding suburbs with dense tree-cover and plenty of green spaces making it the ‘Green City in the Sun’ as is it popularly known. 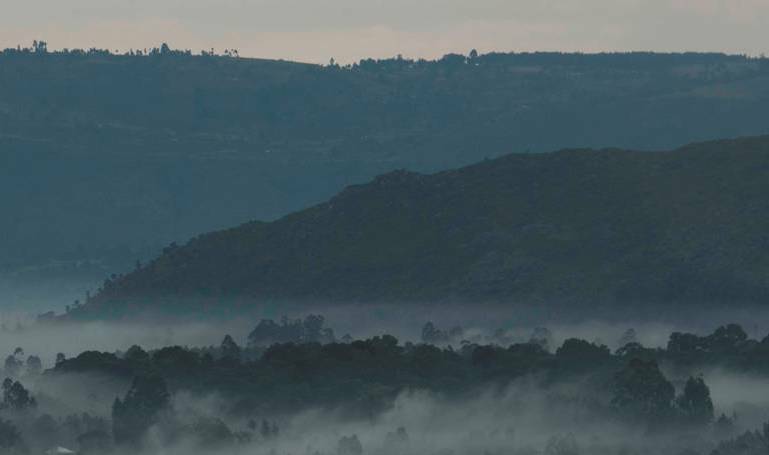 It is situated at 1o1736o49’E adjacent to the eastern edge of the Rift Valley, with the Ngong Hills, west of the city, serving as the most conspicuous geographical feature around the region. The city enjoys a moderate climate at an elevation of 1795m. It has a subtropical highland climate makes for some cool evenings and gets colder especially in the June to July periods, when the temperature can drop to about 10 °C. The sunniest and warmest part of the year is usually from December to March, when temperatures average the mid-twenties during the day. The mean maximum temperature for this period is around 24 °C . There are two rainy seasons which can be moderate. The cloudiest part of the year is just after the first rainy season until around September when conditions are usually overcast with drizzle. As Nairobi is situated close to the equator, the differences between the seasons are typically minimal. The timing of sunrise and sunset also varies little throughout the year for the same reason. Today, many businesses are considering relocating or establishing their headquarters outside the Central Business District area. Two areas that are seeing a growth in companies and office space are Upper Hill, which is situated approximately 4 km from the CBD and Westlands, which is also about the same distance away from the city centre. Many lower-middle and upper-middle income neighbourhoods are located in the north-central areas. Nearlly all of the up market suburbs are situated to the west and north-central of Nairobi where most European settlers resided during the colonial times. 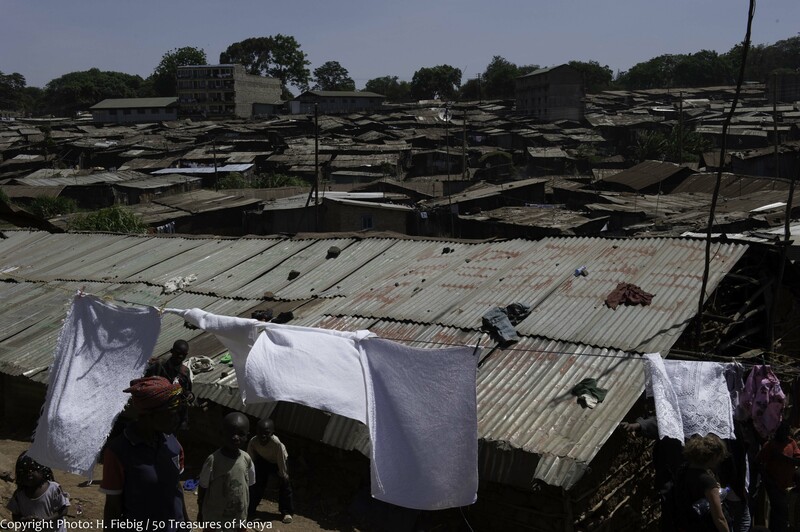 The low and lower income estates are located mainly in far eastern Nairobi. Further southwest, are the Ngong/Embulbul suburbs, which are also considered as part of the greater Nairobi metropolitan area. Although Nairobi serves as both a tourist destination and a transport hub most visitors tend to dive in and out of the city the shortest time possible. This is mostly attributed to its ‘Nairobbery’ notoriety,yet it’s easy enough to evade the worst of the city’s dangers once you are oriented and as far Kenyan cities go, this one has plenty going for it. It’s indiscriminate café culture and titillating nightlife make it virtually the only place in the country where you can get a truly varied menu. The many parks and open spaces throughout the city make it differ in several ways from other Kenyan regions. The most visited of these is the Uhuru Park which is a centre for outdoor speeches, services and rallies. 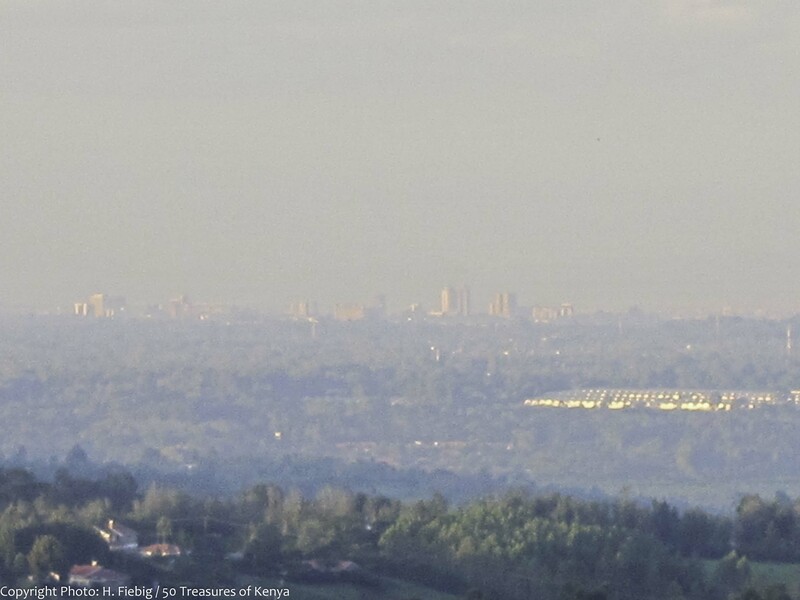 It borders the Central Business District and the neighbourhouring Upper Hill. The Central Park,which is adjacent to Uhuru Park, is also a popular spot. Futher from the CBD, along Langata road near the Wilson Airport is the Uhuru Gardens. It is the largest memorial park in Kenya and national monument where the first Kenyan flag was raised at independence. Other notable clearances include the Jeevanjee Gardens, City Park, 7th August Memorial Park and the Nairobi Arboretum. 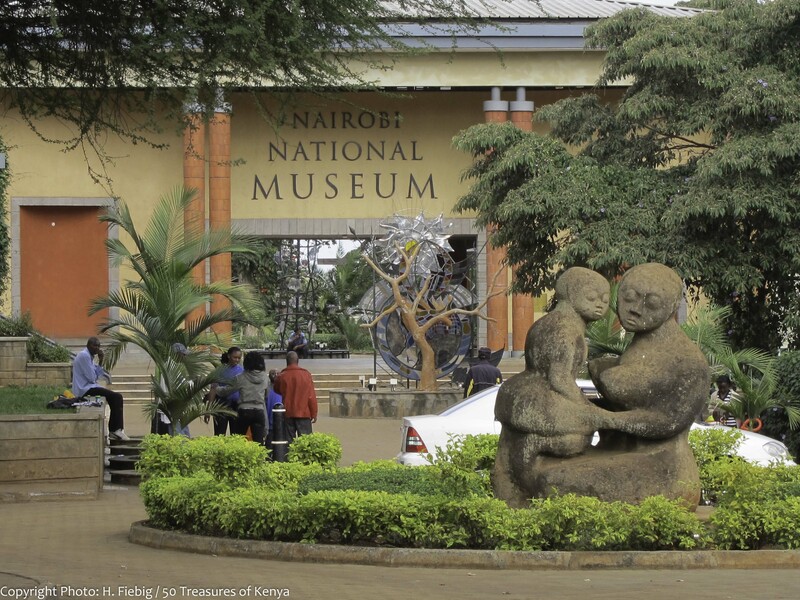 Nairobi is home to the Nairobi National Museum’s, which is the largest in the city. It houses a large collection of artefacts portraying Kenya’s rich heritage through history, nature, culture and contemporary art. 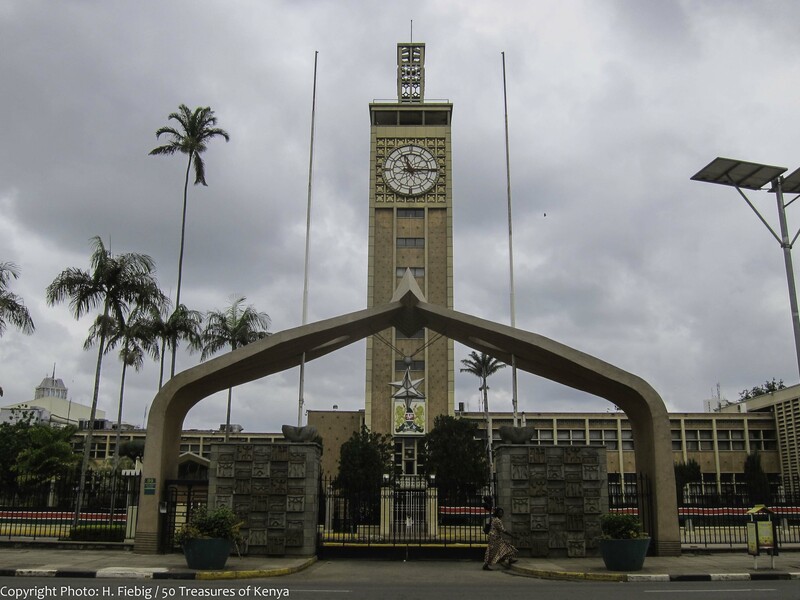 Other noteworthy places include Jomo Kenyatta’s Mausoleum, Kenya National Theatre, Bomas of Kenya and the Kenya National Archives. The top art galleries in Nairobi include the Rahimtulla Museum of Modern Art and the Mizizi Arts Centre. 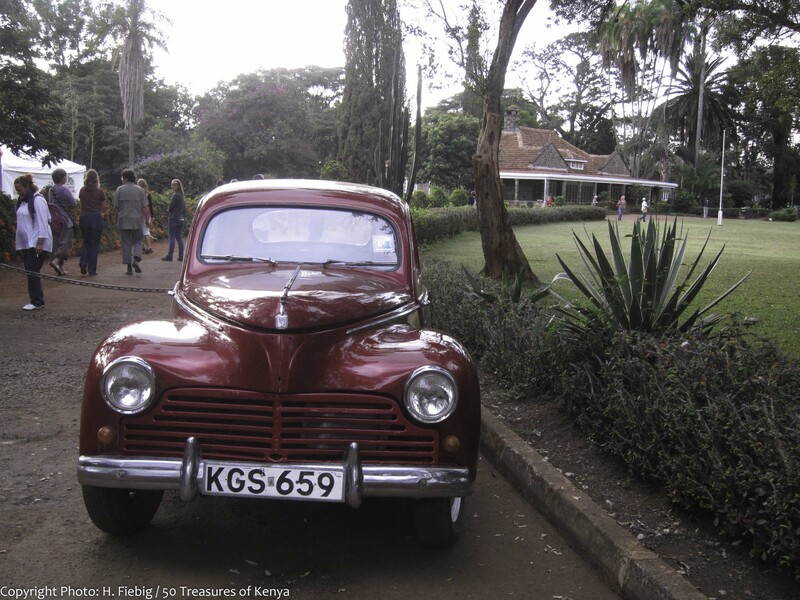 There are also other smaller yet popular museums like the Nairobi Railway Museum and the Karen Blixen Museum which is located in the affluent Karen suburb. Built in 1912 ,the bungalow-style house bought by Karen Blixen and her then-husband in 1917, was once the centre piece of their farm life. The grounds, which feature original equipment from the coffee farm, are available for touring visitors are interested in guided tours of the house. Its rooms are designed in both the original decor and props from the 1985 film, ‘Out of Africa’ ,an Oscar winning movie based on Karen’s an autobiography by the same title. There is also a gift shop within the premises and the museum is open every day between 9:30 a.m and 6.00 p.m, including on weekends and public holidays. The African Fund for Endangered Wildlife Giraffe centre is approximately 5 km from the city centre. It was founded in 1979 by Jock Leslie-Melville, the Kenyan grandson of a Scottish Earl, when he and his wife captured an infant giraffe. Their aspiration then was to start a programme of breeding giraffe in captivity at their home in Langata. Today this sanctuary is an acclaimed refuge for the endangered Rothschild giraffe that is found only in the grasslands of East Africa. The center also operates as an educational program for Kenyan school children to teach them about wildlife conservation. Feeding giraffes from a raised observation platform is a good place to get the close-up photographs that eluded you on a safari. The centre is also home to several warthogs which freely roam the area along with the giraffes. It is futhermore the location of the Giraffe Manor, one of Nairobi’s most iconic historical buildings. This edifice dates back to the 1930s and is reminiscent of the early days of Europeans in East Africa. The estate is now an exclusive guesthouse where the giraffes pay an occasional visit as wander freely through the verdant gardens. Also located in Nairobi’s leafy Karen suburb, about 13 km away from the cacophony of the city, is the Nairobi Mamba Village resort. Spread over 30 acres, it is home to around 70 Nile crocodiles that are known to be the largest of the species and the most dangerous.There are also giraffes, camels, an ostrich park and a peacock pen in the facreage along with a variety of other birds. It has a man-made lake with boats and fairground equipment in addition to its entertainment. It is also fitted with a camp site and accommodation tents, restaurant, conference facilities, party and wedding facilities and an animal farm that are perfect for a group of up to 80 children or 50 adults. Mamba Village also has within its grounds a deluxe campsite for more up luxurious accommodation. The city’s night life is very popular with both young and old tourists. From a collection of gourmet restaurants and bistros offering local and international cuisine, Nairobi has something to offer to every age and pocket. Most common known food establishments include The Carnivore and Tamarind Restaurants which have outlets in Langata, the City Centre and the Village Market. For the more experiential travellers, one can choose from a wide array of local dishes, exotic cuisines and fast food establishments around its boroughs. 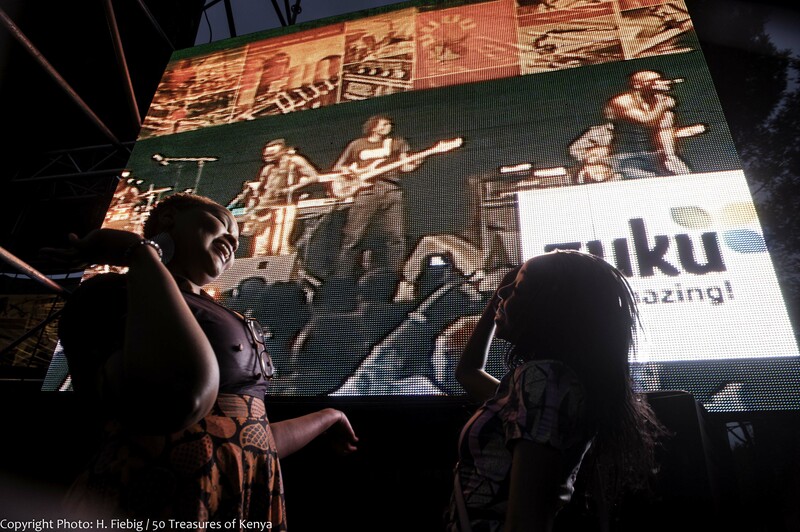 The most popular clubbing spots are centred in up-market Westlands which has come to be known as Nairobi’s ‘Electric Avenue’. 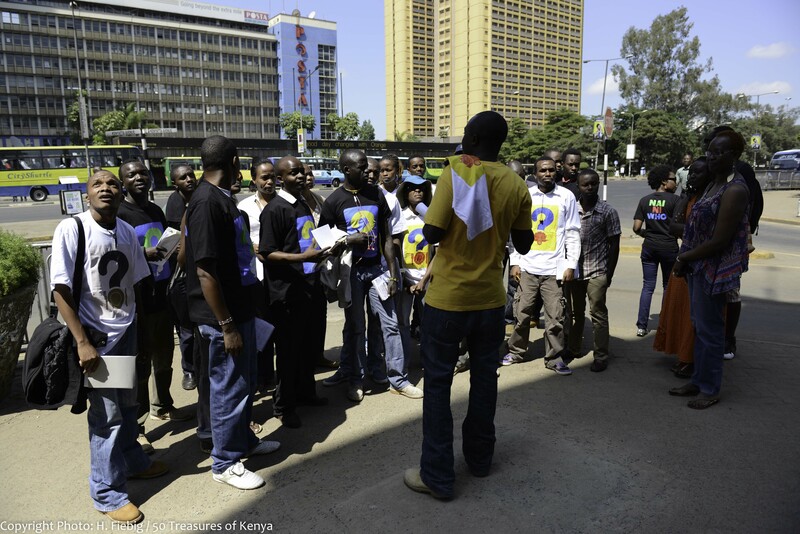 Other choice haunts can be found in Karen, Langata, Hurlingham and “uptown” venues in the city centre. 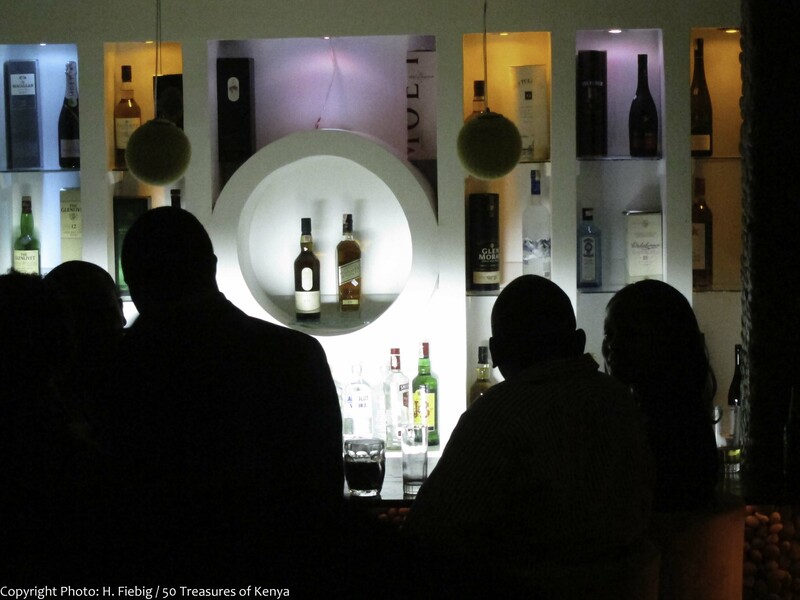 Nairobians generally go out every day of the week and most establishments are open till late. There are a number of shopping malls in the Nairobi Area. These include: The West Gate mall, Prestige Plaza, the Village Market, the Sarit Center, the Junction. A variety of amenities are provided at these malls and include cinemas, fashion and apparel boutiques, bookshops, electronics and grocery stores, coffeehouses, restaurants and bars. 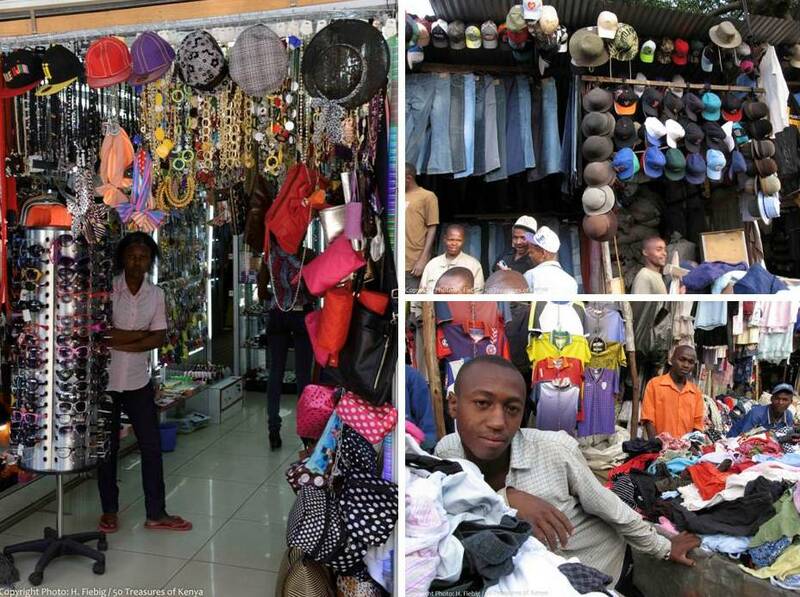 One of the great experiences for visitors in Nairobi is a visit to the exhibition stalls and open air markets. Bargaining is the name of the game and vendors are usually willing to negotiate prices with shoppers. If you are not a local, it is advisable whenever possible to have someone with you who speaks the language and is conversant with the special bargaining lingo of the market vendors so that you can get the best deals for your purchases. Second-hand clothes or ‘Mitumba’ markets are also quite common and are a ideal option for those who want to be fashionable yet budget conscious. Nairobi is East Africa’s sporting centre and football is the most popular sport. Its premier sports facilities are the Moi International Sports Centre in Kasarani and the Nyayo Stadium located close to the CBD. These venues make them convenient locations for international tournaments, national events and social gatherings. Other notable annual competitions staged in Nairobi include Safari Rally, Safari Sevens rugby union tournament, and the Nairobi Marathon. 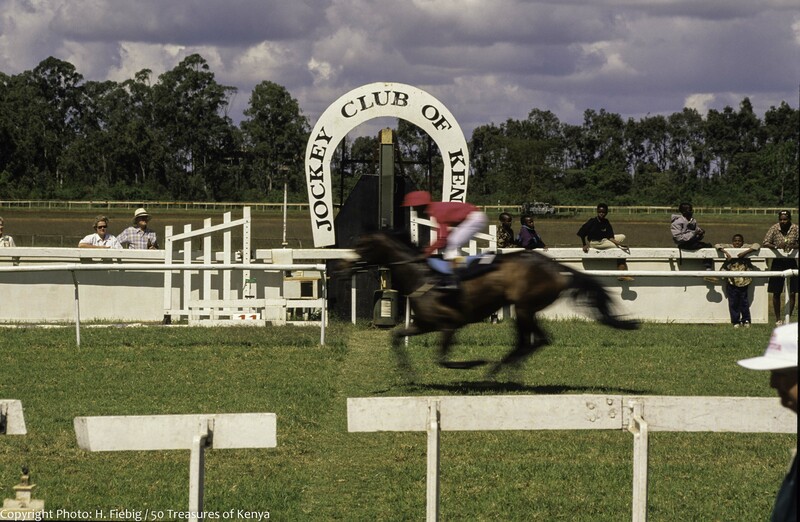 The Ngong Racecourse in Nairobi is the center of horse racing in Kenya. Golfing is another growing attraction, with six courses within a 20 km radius of the city The big-league golf clubs include the Windsor Country Club, Karen Country Club and Muthaiga Country Club. The Kenya Open golf tournament, which is part of the Challenge Tour,, in addition takes place here. In Nairobi is also has the largest ice rink in Africa, the Solar Ice Rink at the Panari Hotel’s Sky Centre. The crowded city center is actually safe to walk in compared to a few years back, when muggings, carjackings and kidnappings emptied it as residents began referring to Nairobi as “Nairobbery.” Today walking around Nairobi is relatively safe as the town is small and accessible. However, some areas can be a security risk and it is best to seek local advice before setting out. 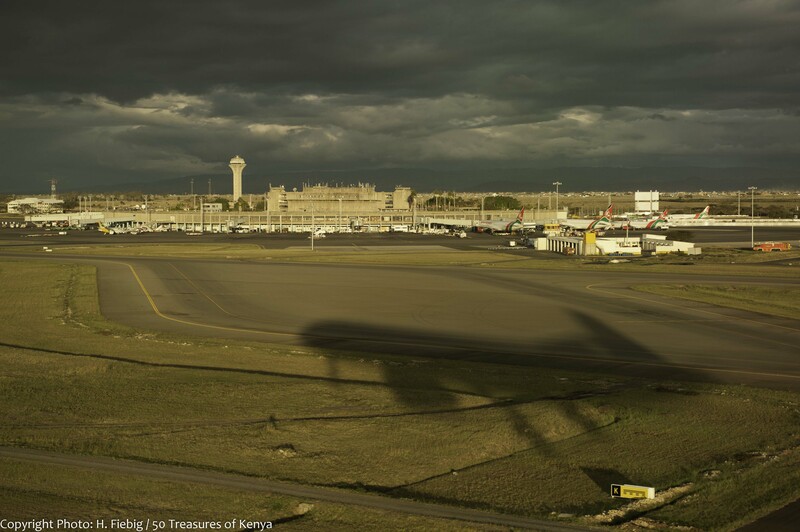 The main airport is Jomo Kenyatta International, located 15kms out of the centre of town. JKIA handles both International and domestic carriers. The Wilson airport, located 11 kms outside of the city centre, is the domestic hub for both scheduled and chartered domestic flights. The city is served by highways that link Mombasa to Kampala and Arusha and most of the roads are tarmacked. 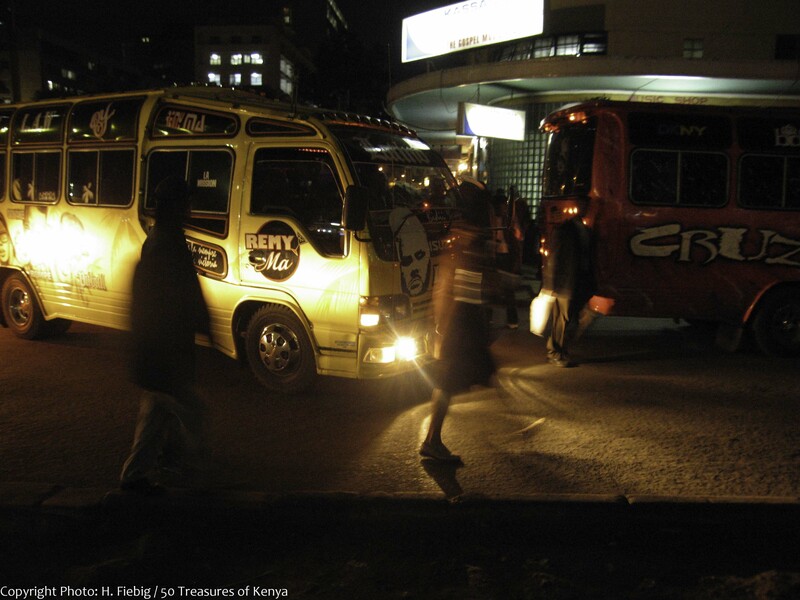 Matatus which ply through the city are the most common form of public transport. 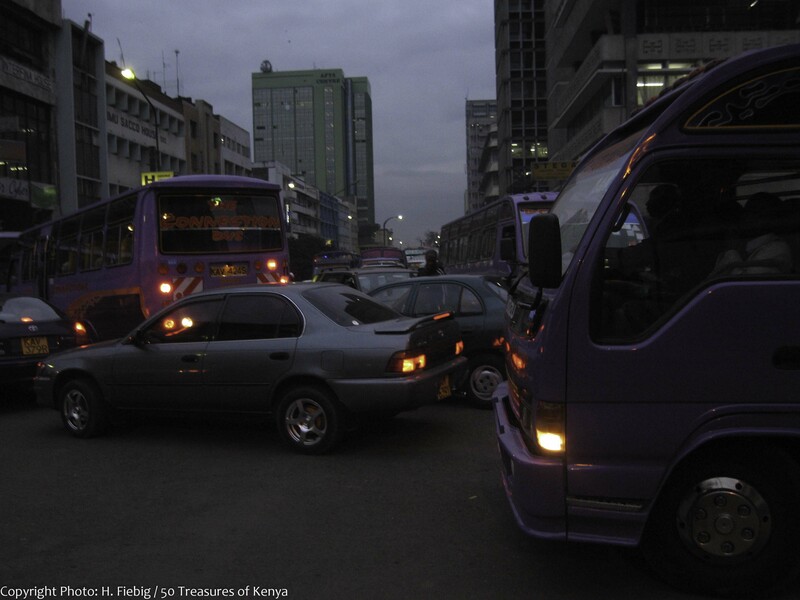 These matatus are privately owned minibuses and generally seat fourteen to twenty-four passengers though some operators still tend to overload them. Taxis are also widely available and convenient. They are often parked in the streets around alloted buildings and are marked with a yellow line along each side. These taxis are not metered and prices should be agreed with the driver before departure. Always ask for local advice or at your hotel for correct rates. There are several Taxi companies which operate with phone bookings, modern vehicles and competent drivers at reasonable rates. Several of these companies also have airport booking offices. Buses are becoming increasingly common throughout the city and also operate on set routes and schedules. Since Nairobi serves as the centre of Kenya’s extensive bus network, many bus companies operate to and from destinations all over the country. They can be boarded at any stop and tickets can be purchased on board. Nairobi was founded as a railway town, and the main headquarters of Kenya Railways is still situated at Nairobi railway station, near the city centre. The line runs through Nairobi, from Mombasa to Kampala. Though its main use is for freights, there are regular night passenger trains which connect Nairobi to Mombasa and Kisumu. A number of morning and evening commuter trains connect the centre with the suburbs although the city has no proper railing system. 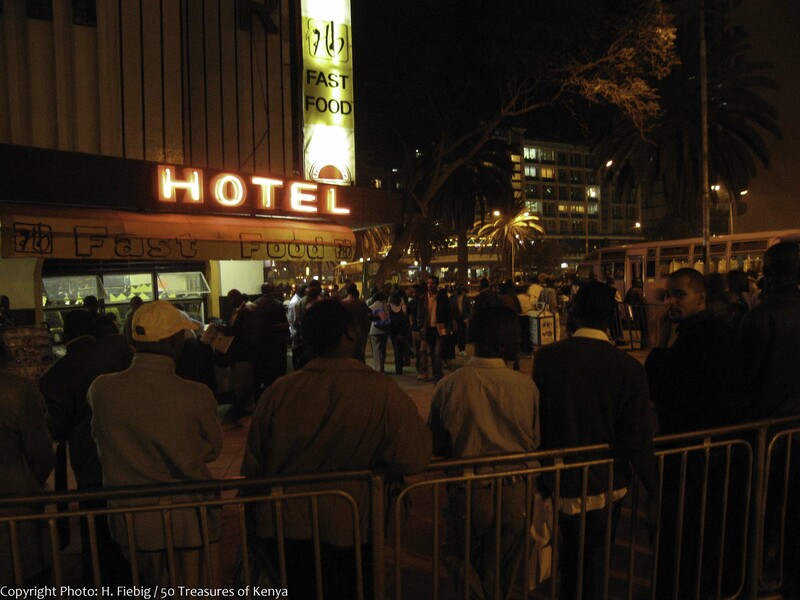 Nairobi has many grand hotels to cater for its visitors. 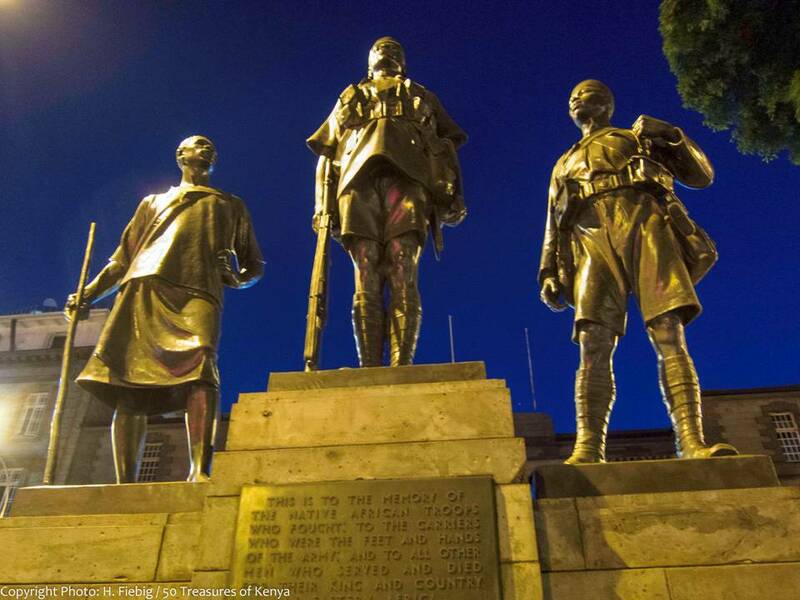 As the British occupiers started to explore the region, they started using Nairobi as their first port of call. This prompted the colonial government to build several impressive hotels in the city whose main occupants were mainily big-game hunters. Its reputable hotels include the Nairobi Serena Nairobi, Laico Regency, Windsor, Holiday Inn, Nairobi Safari Club, The Stanley Hotel, Safari Park & Casino, Inter-Continental, Panari Hotel, Hilton and the Fairmont Hotel. Other newer introductions include the Crowne Plaza Hotel in Upper Hill area, the Sankara Nairobi in Westlands, Tribe Hotel-Village Market, House of Wayne, The Eastland Hotel, Ole Sereni and The Boma located along Mombasa Highway. There are also a number of International chains apart from the Hilton, the Intercontinental group and Serena Hotels currently setting up prime properties in the city.